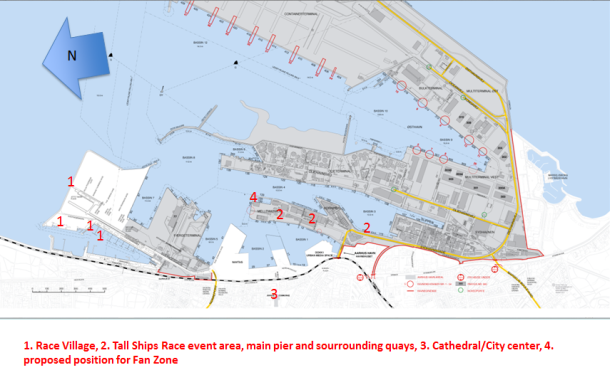 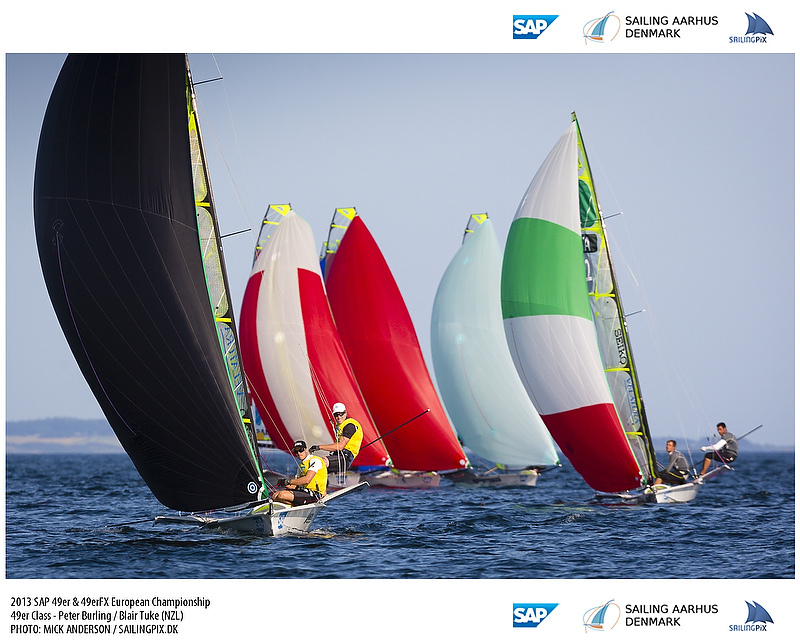 The most wide open sailing championship in 2013! 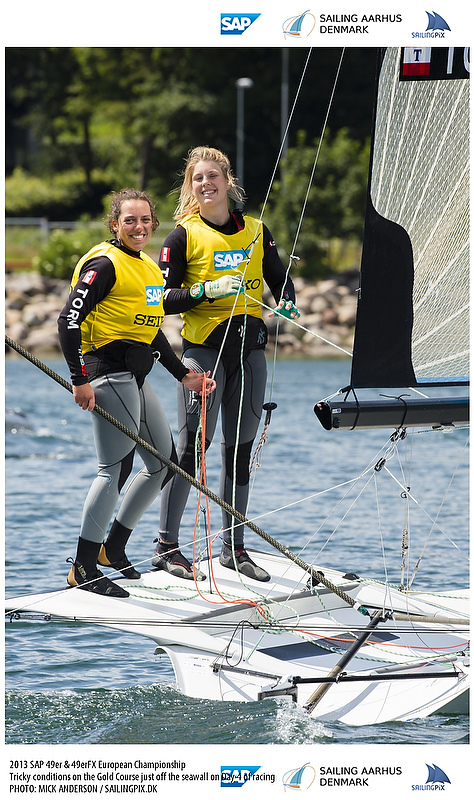 The 2013 SAP 49er European Championships marks the first time all the contenders for Rio 2016 will face off against one another since London 2012… well, almost all. 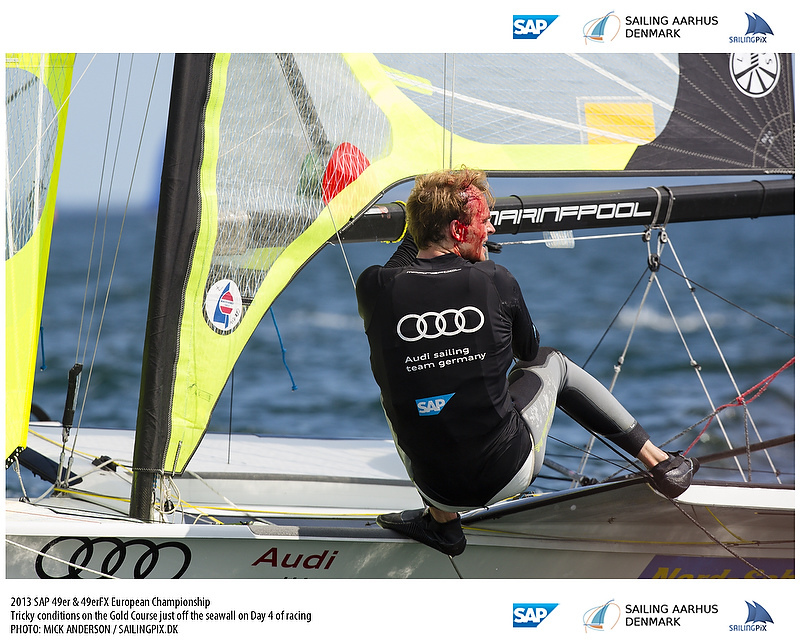 Conspicuous in his absence is Nathan and Goobs, who are off competing in the AC, and they won’t be back until the worlds in September. 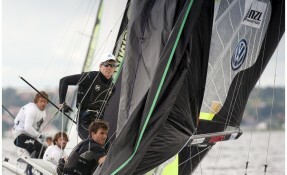 This championship is wide open in a way that the 49er has not seen in some time. 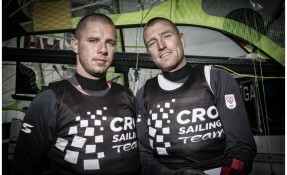 While the 49er class has always been competitive, there have also been teams who have dominated for periods, Chris Nicholson, Iker & Xabi, Draper and Hiscocks, and recently Nathan Outteridge. Since the London games, however, the class has seen 10 different winners in the 10 major events. 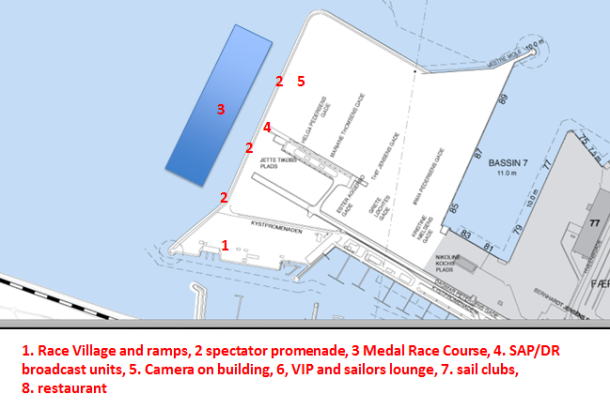 Luckly, for sailing fans, you’ll all be able to watch this championship unfold live as we’ll be live broadcasting the final 3 days of the event, July 5-7 at noon each day, on 49er.org. 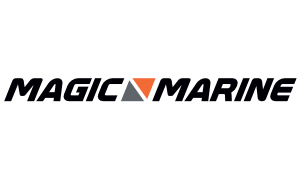 Lets take a look at the teams that have won, before we take a further look at the surprisingly large number of teams who haven’t won recently but could win here. 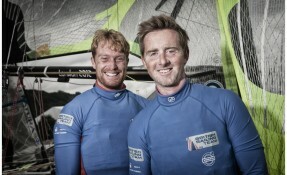 This is an experienced team who have really taken to the theatre style racing the class has been testing since London. 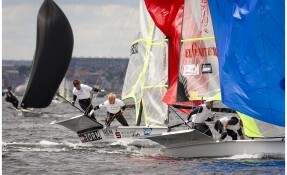 They stormed back from 6th position heading into the final day in the 2012 Europeans to win outright in the winner takes all final of the top 4 boats after a convincing performance to make the top 4. 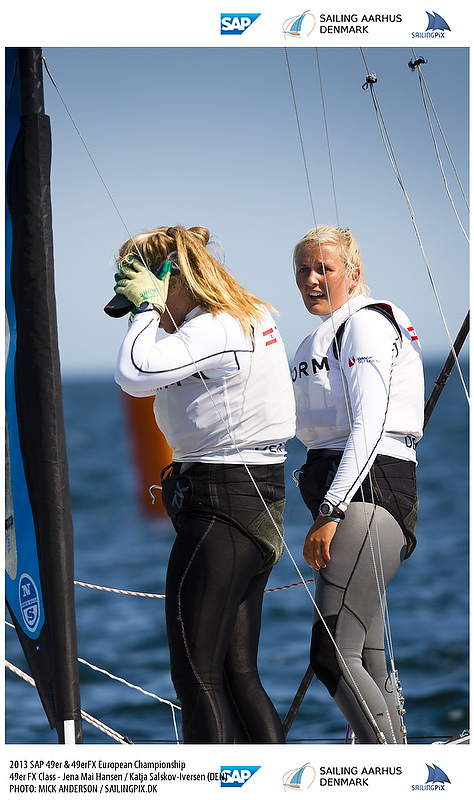 Since then they’ve been in the finals of almost all the events they’ve competed in, although they did bomb out in Hyeres getting stuck in Silver fleet. 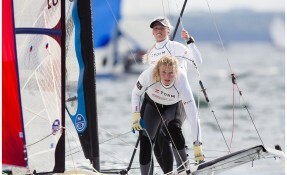 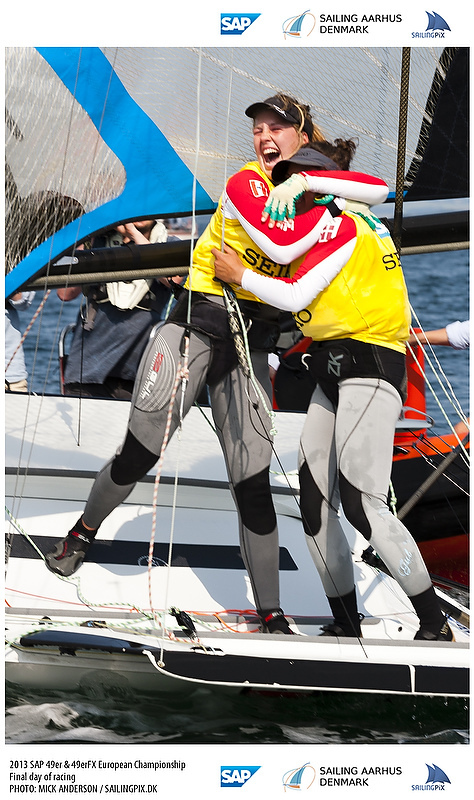 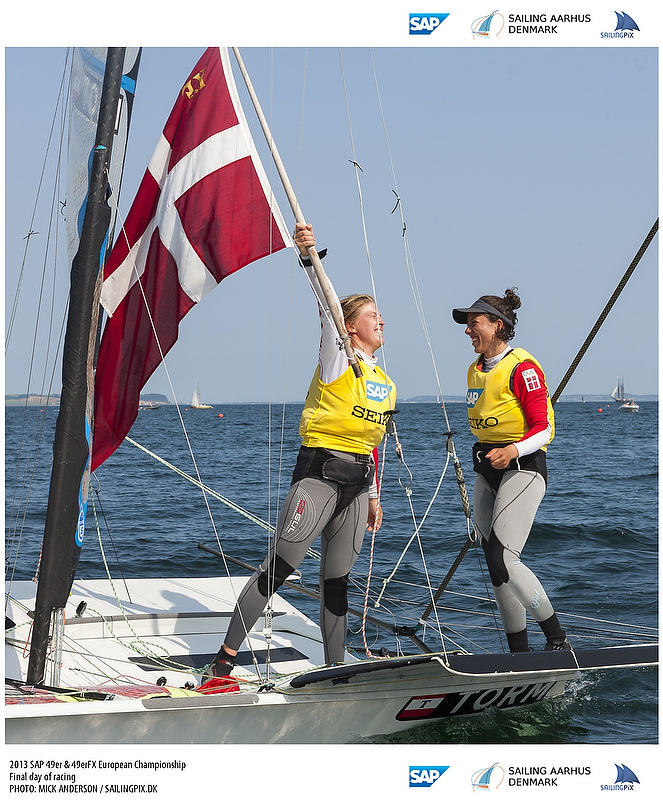 Both of these two sailors will be at the Euros, though in different partnerships to how they lined up in Melbourne this winter. 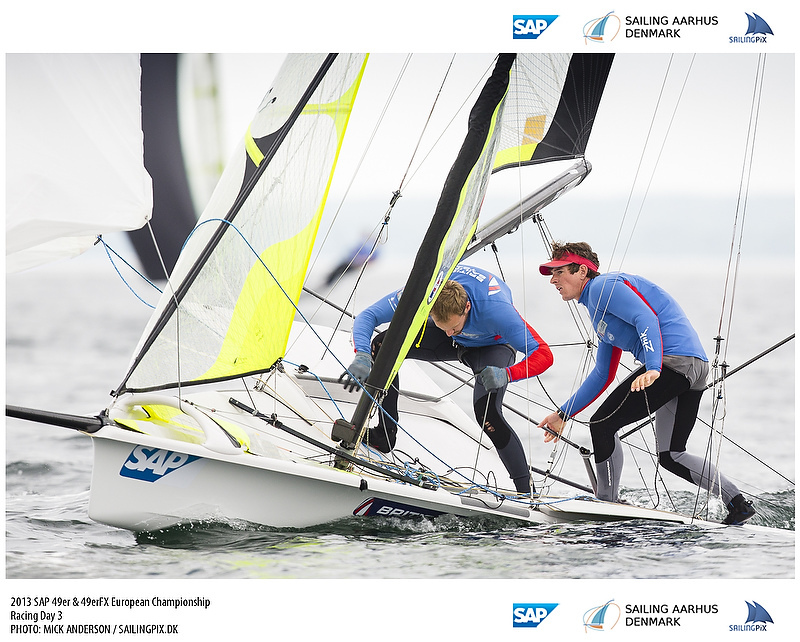 Both competed in Kieler Woche last week with the team of Will Phillips and Rhys Mara in serious contention for the win until an unfortunate capsize at in the leeward gate during some fantastic racing. 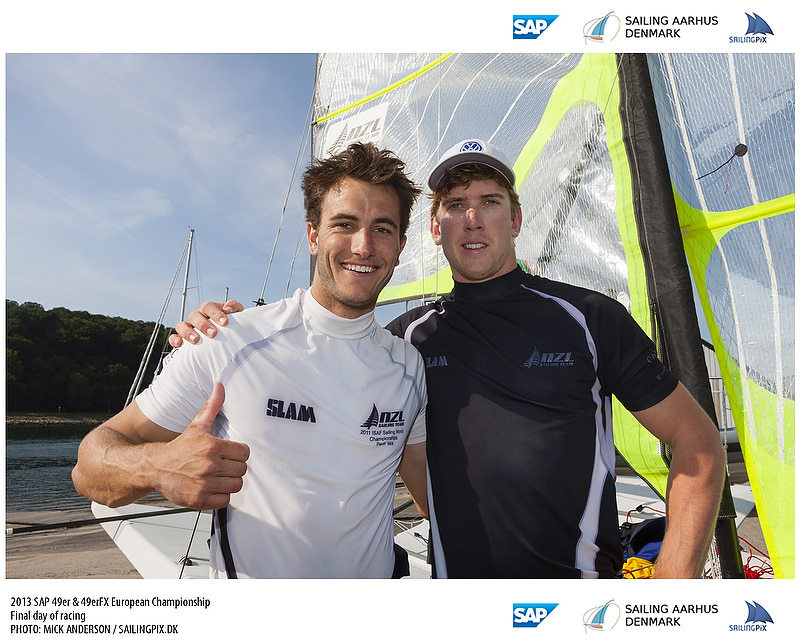 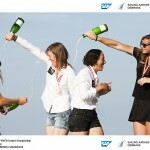 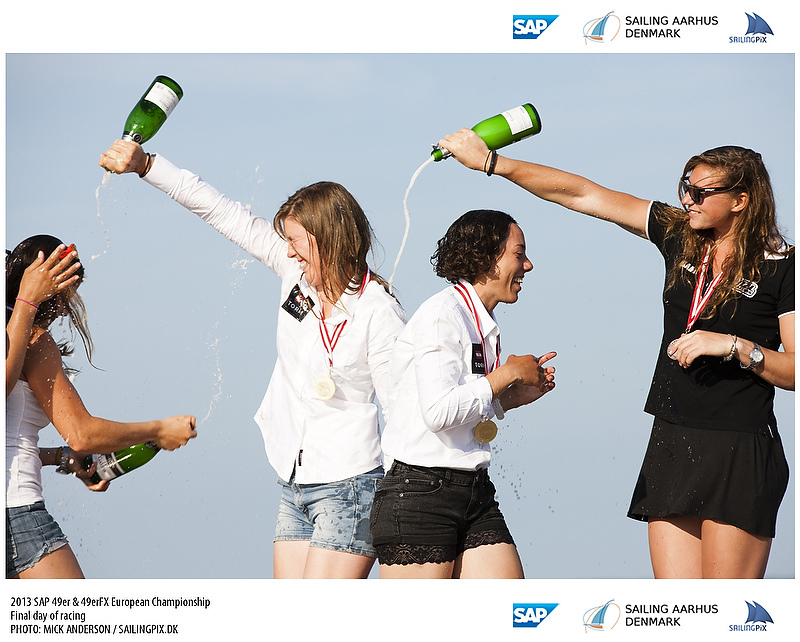 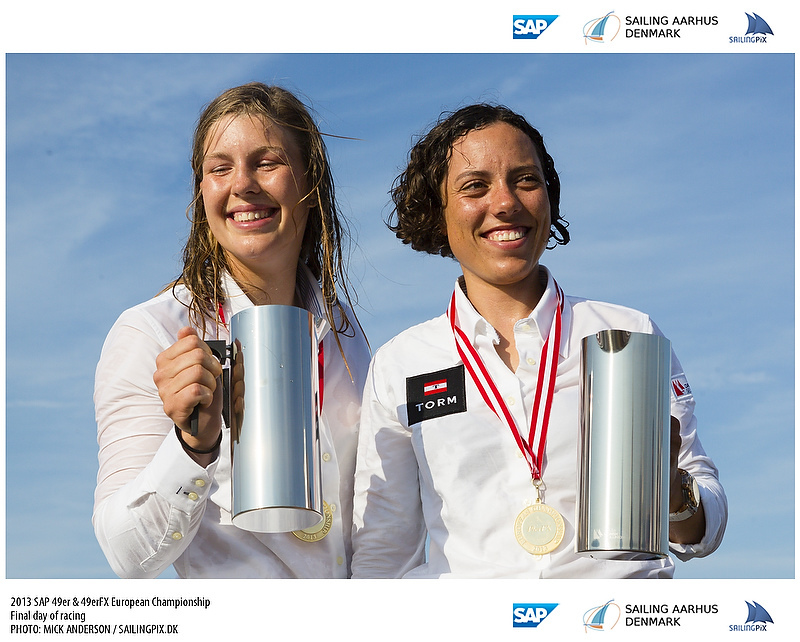 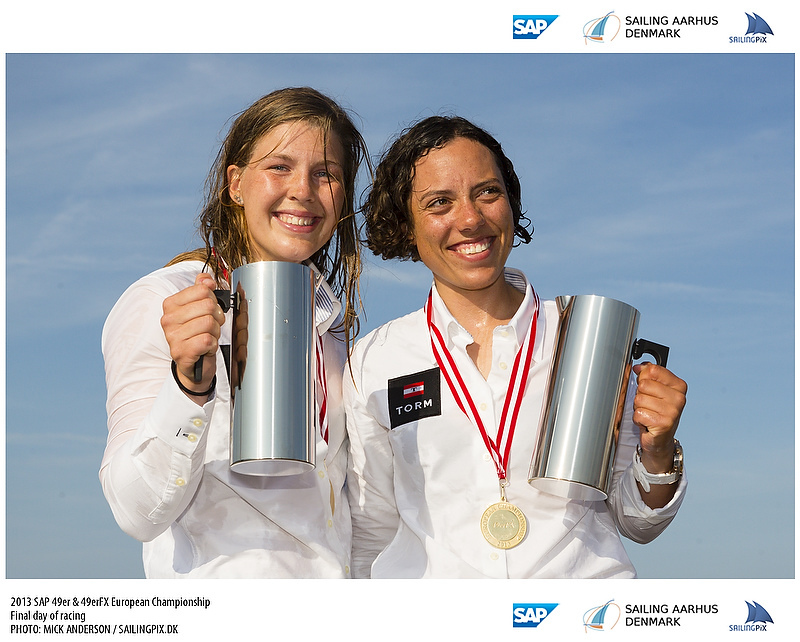 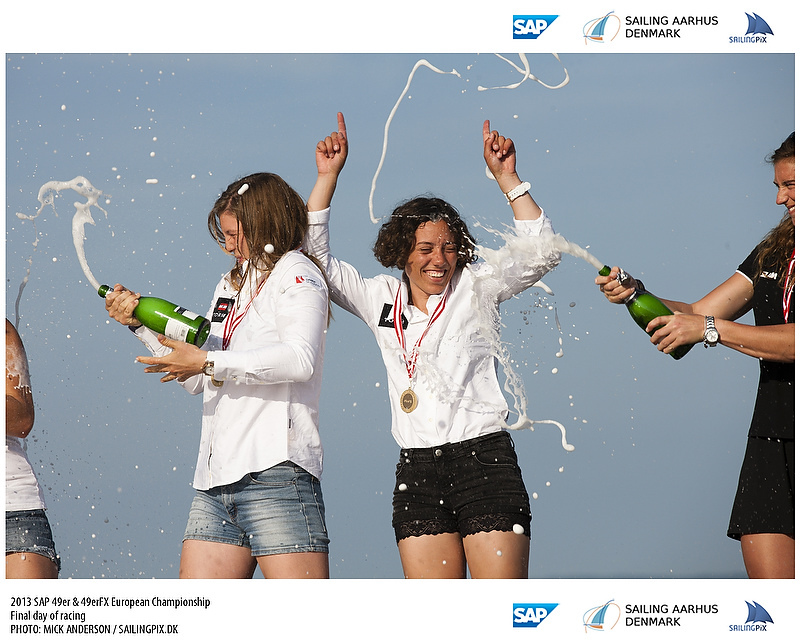 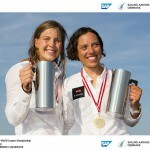 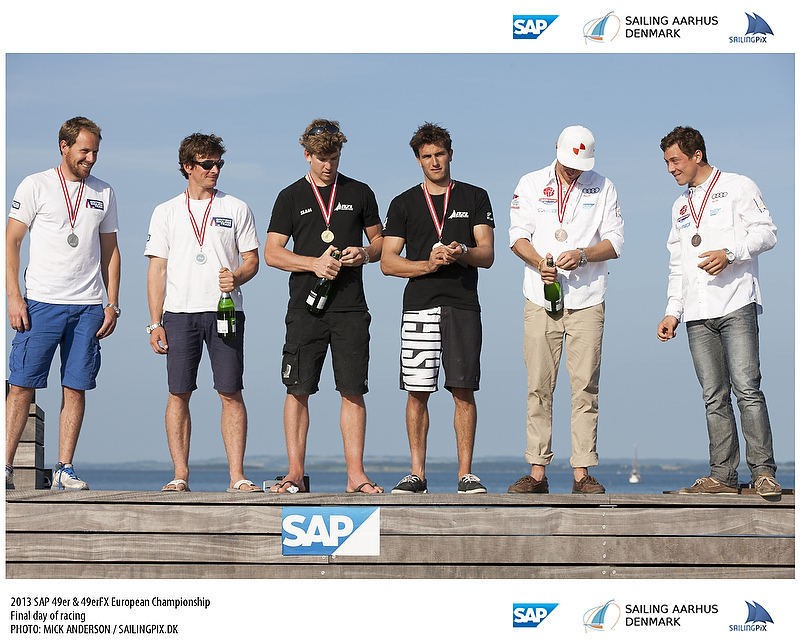 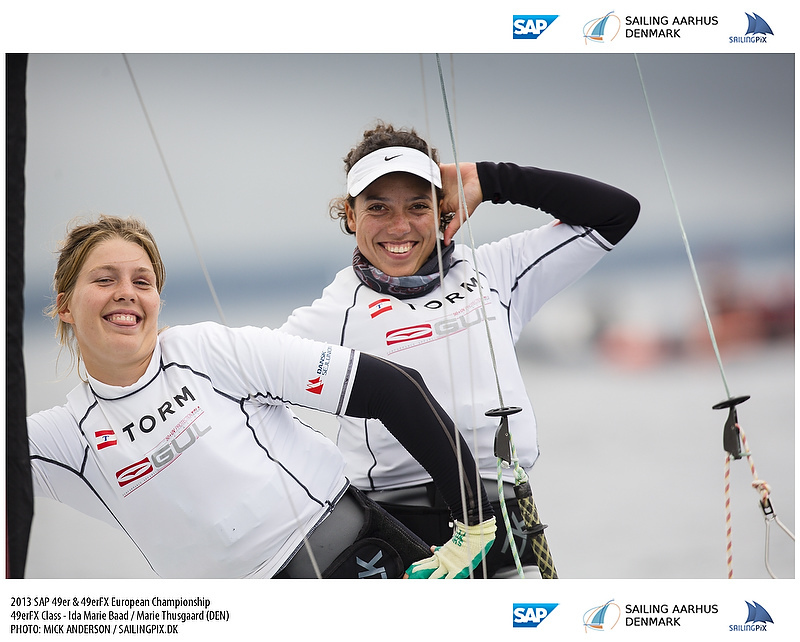 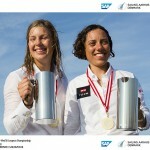 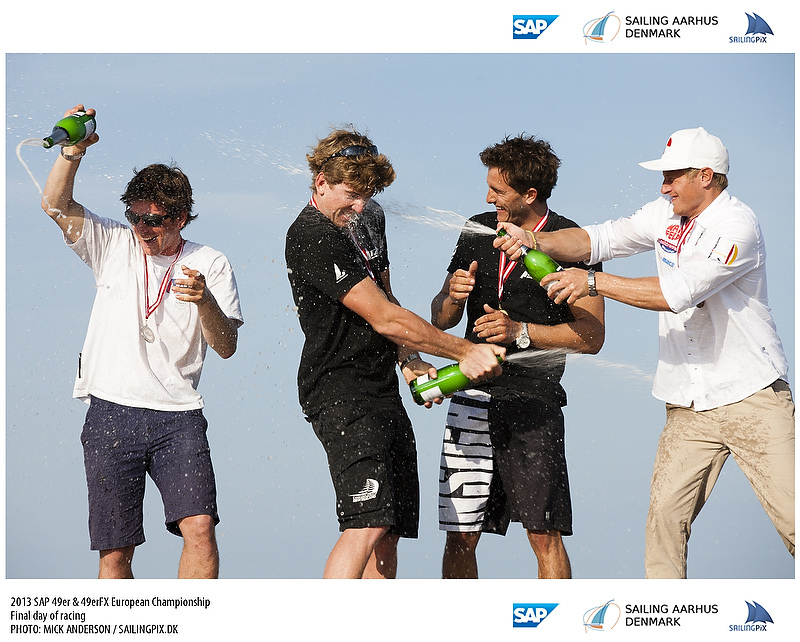 They were also called out by SAP analyst Marcus Baur for being the most consistent performers during the regatta… till they put it in the drink. 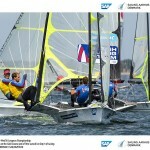 We’ll see if this new team of experienced sailors can put it all together! 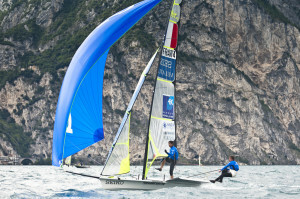 American Teams have been consistently strong in the 49er for the duration of it’s Olympic inclusion since the MacKee brothers took Bronze in Sydney and at one point turned North America into a skiffing center. 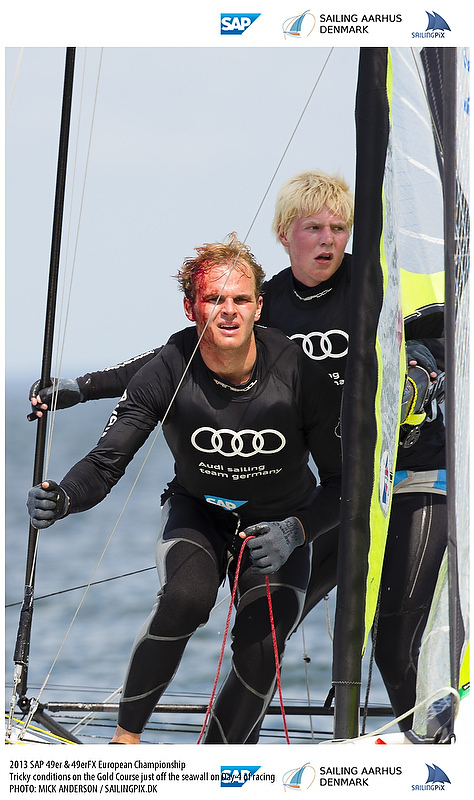 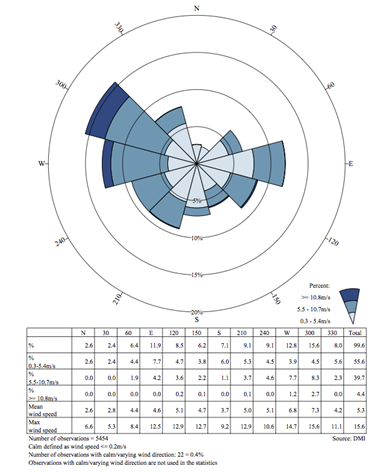 This quad, the revolution of top 49er sailors appears to be holding again with a couple top teams in both the 49er and 49erFX training under the tutelage of Luther Carpenter. 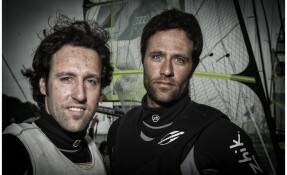 These guys have been putting in some time in San Fran, so I’m guessing their hoping for some big breeze! 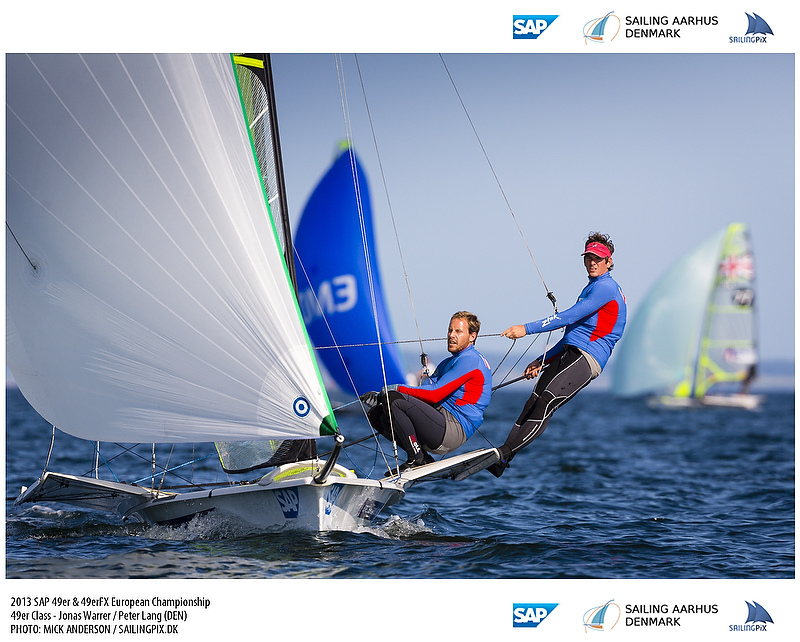 In an 80 strong fleet in Palma this year, Eric and Tommy lit up the fleet for one of the more dominating performances the fleet has seen this year. 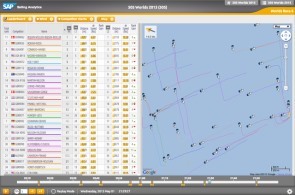 On day 1 of the gold fleet they won 4 straight races and then continued to impress through the rest of the event to win comfortably in the theatre. 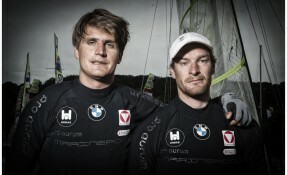 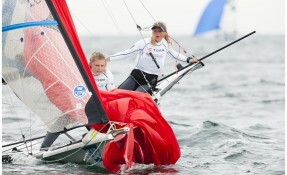 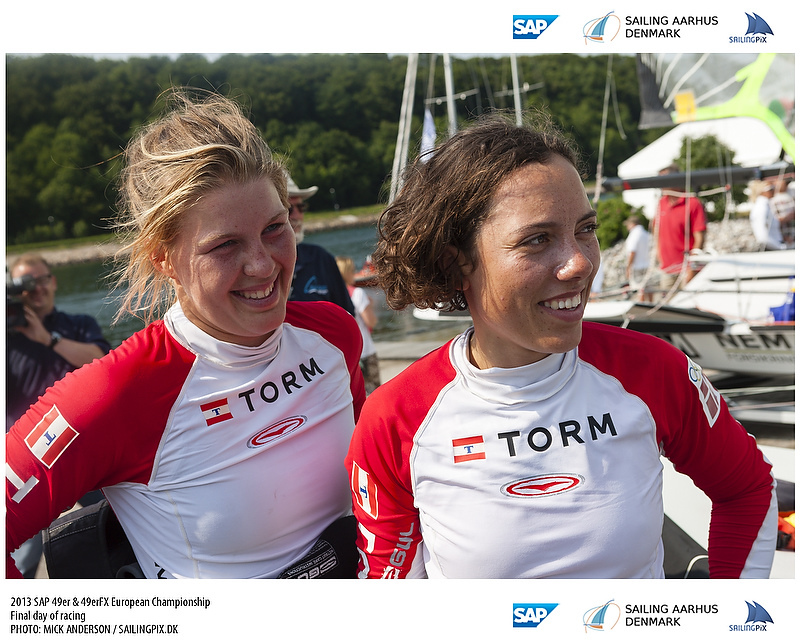 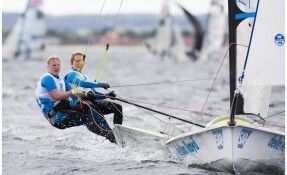 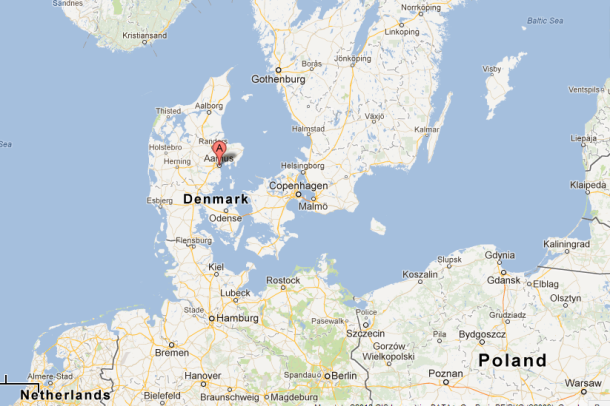 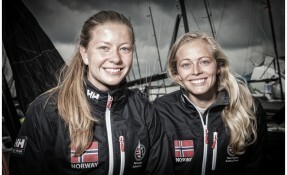 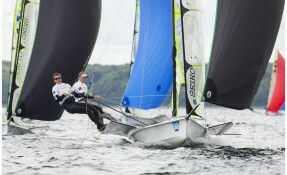 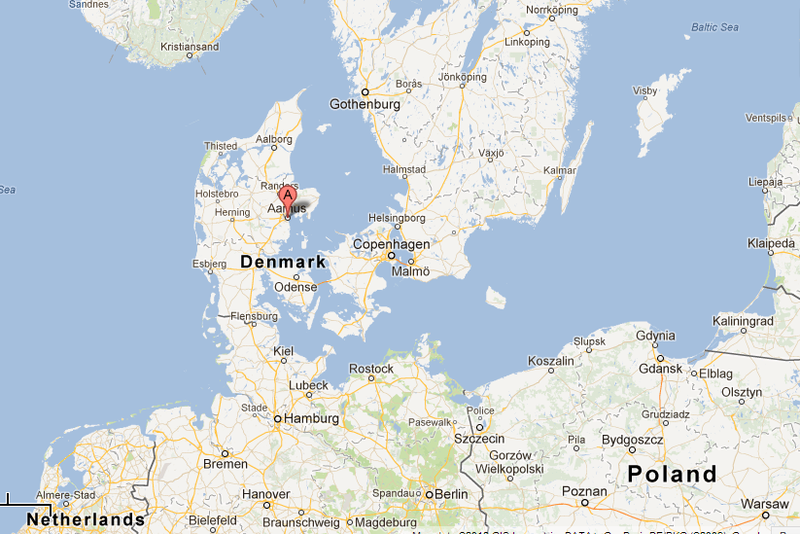 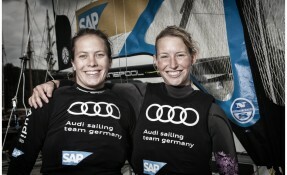 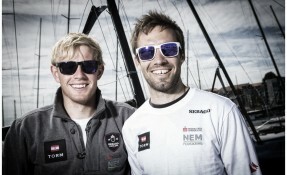 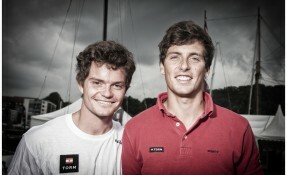 With a 2nd place at their home regatta in Kiel, they look poised to contend. 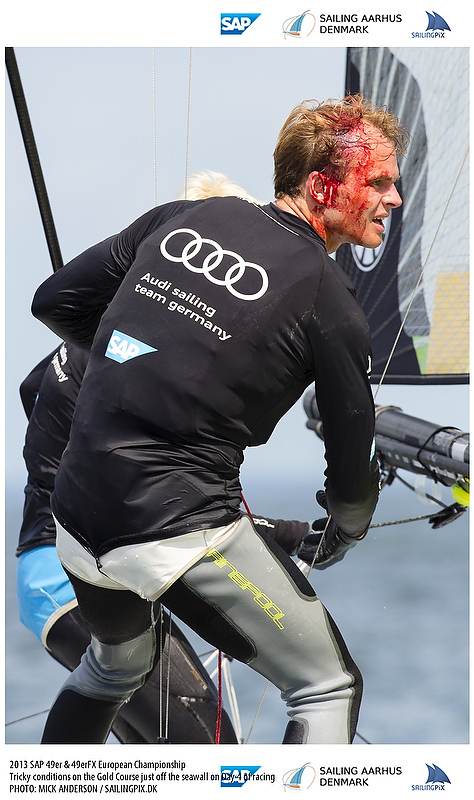 This was one of the closest regattas of the year in the 49er… before the theatre that is. 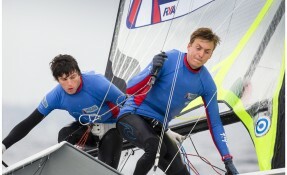 Dyl and Al went into the final tied with Silverline Racing team members Dave Evans and Ed Powys only to dominate the theatre and take the win. 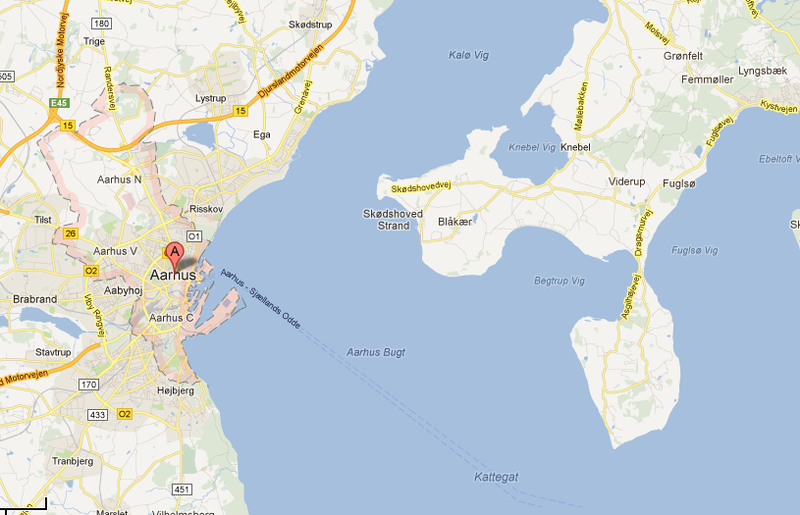 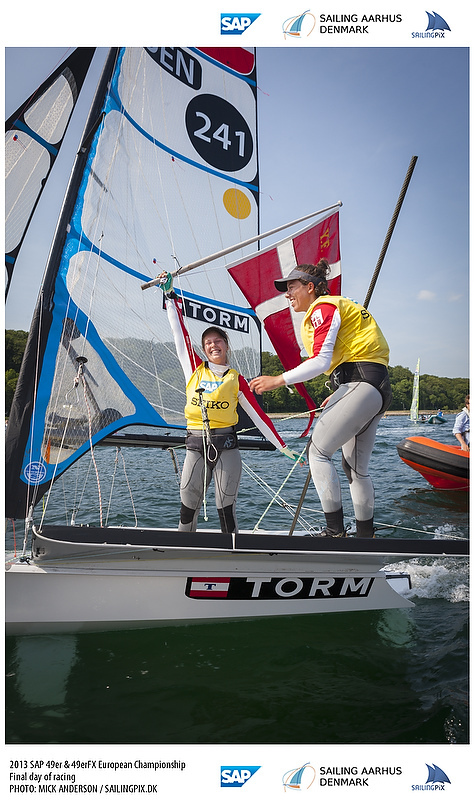 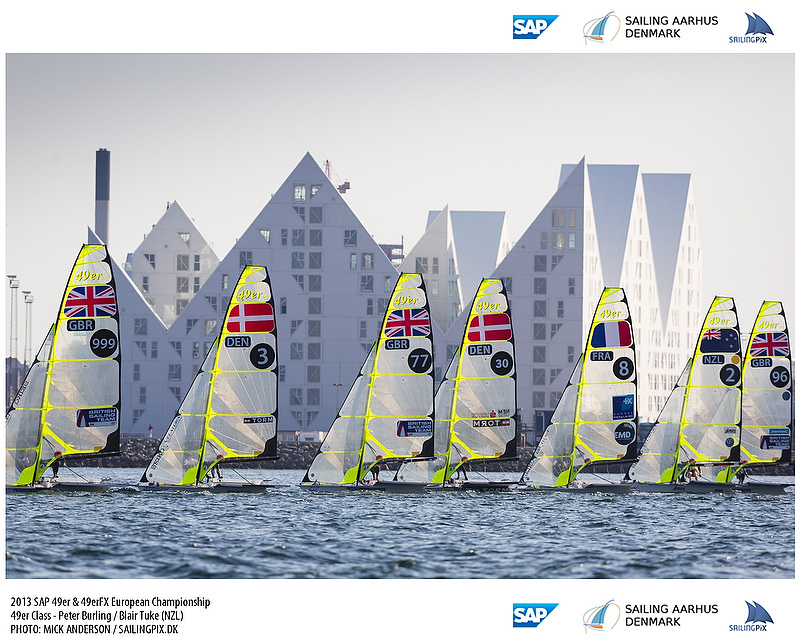 These two teams have been at the top of every fleet they haveraced, so expect them to contend once again here in Aarhus. 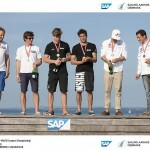 Marcus and Josh were actually second fiddle through most of this event to Nico and Niko of Austria. 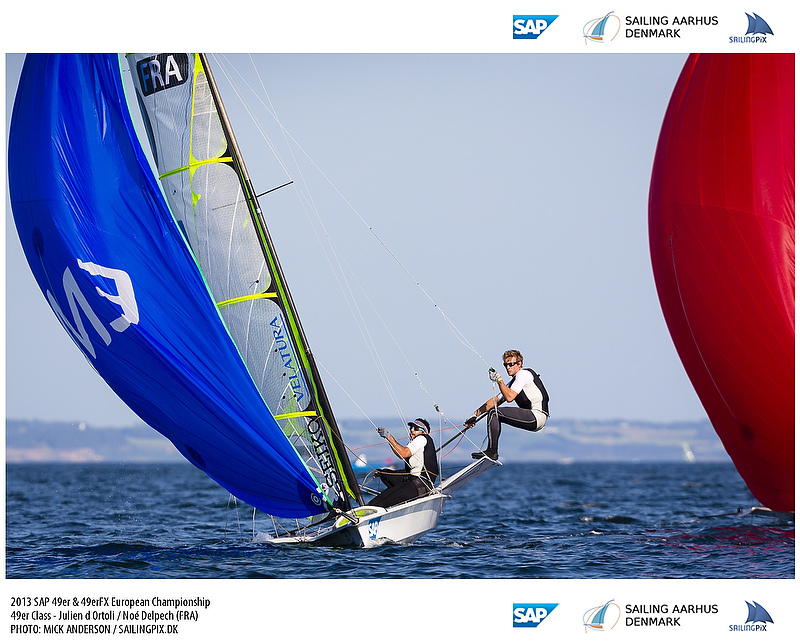 They final day was heavily weighted in the event scoring, and these two younger New Zealanders took full advantage sailing brilliantly in the theatre to lock up the victory. 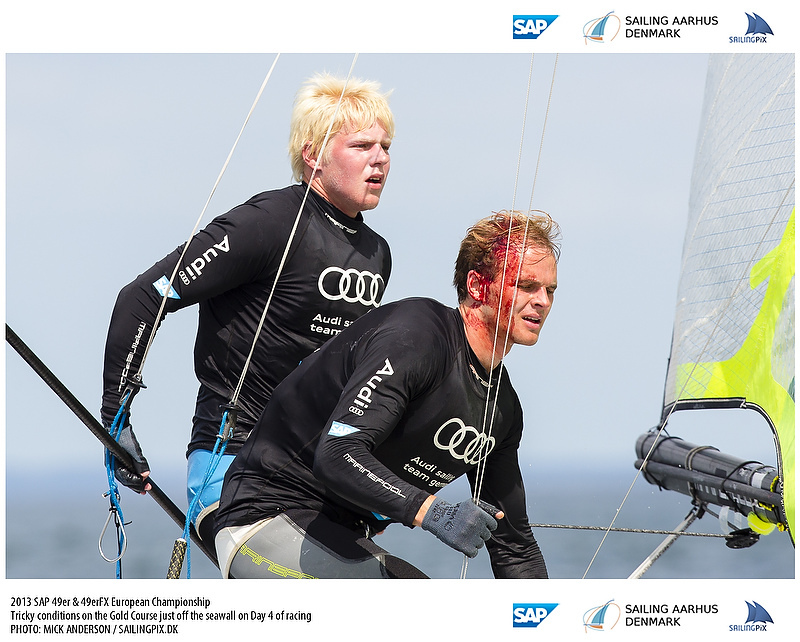 There was only 1 point in it heading to the final race when they got the Nicos in a port/starboard at the start line and went on to an easy victory from there. 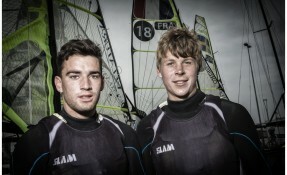 Often in the shadow of their Silver medal countrymen, these two are still very young and already contending! 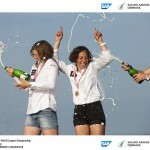 This team is clearly no accident in landing on the top of the podium. 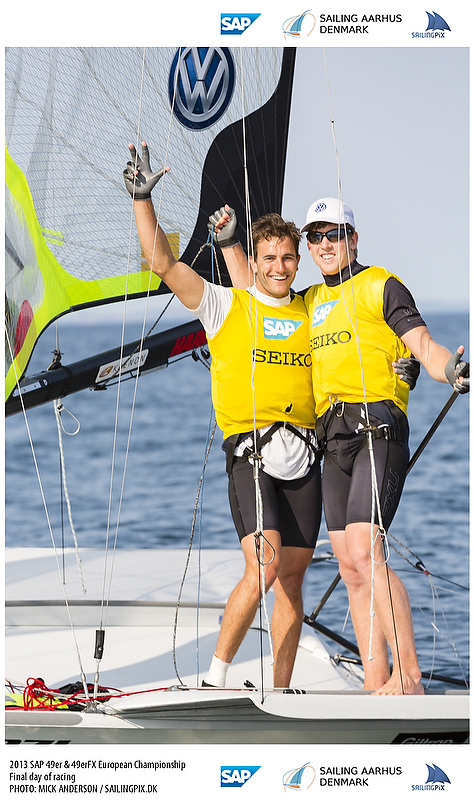 Combining the 2008 Gold medal helmsman with the 2012 Bronze medal crew is an obvious choice to label contender from the start. 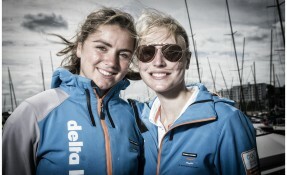 The Delta Lloyd regatta was their only win of the season though they have been in the mix each time they’ve raced. 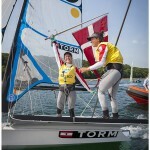 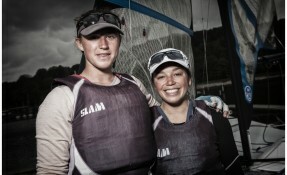 These two have been training hard and sailing well all year. 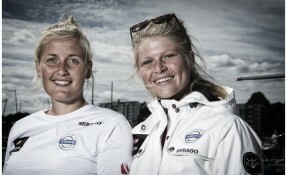 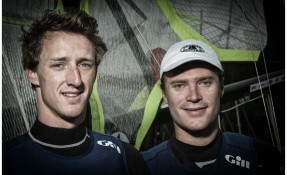 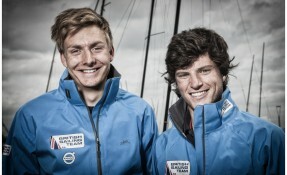 On local waters, in front of a nation of supporters, and a VIP boat full of sponsors, these two will be pushing hard! 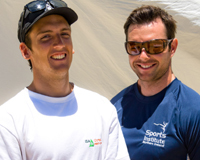 Ryan and Matt have taken most of the winter off, with Ryan doing some university work and Matt having a ‘real job’ for the first time in his life. 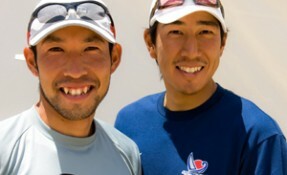 They kept fit through the winter doing other things and clearly have not missed much. 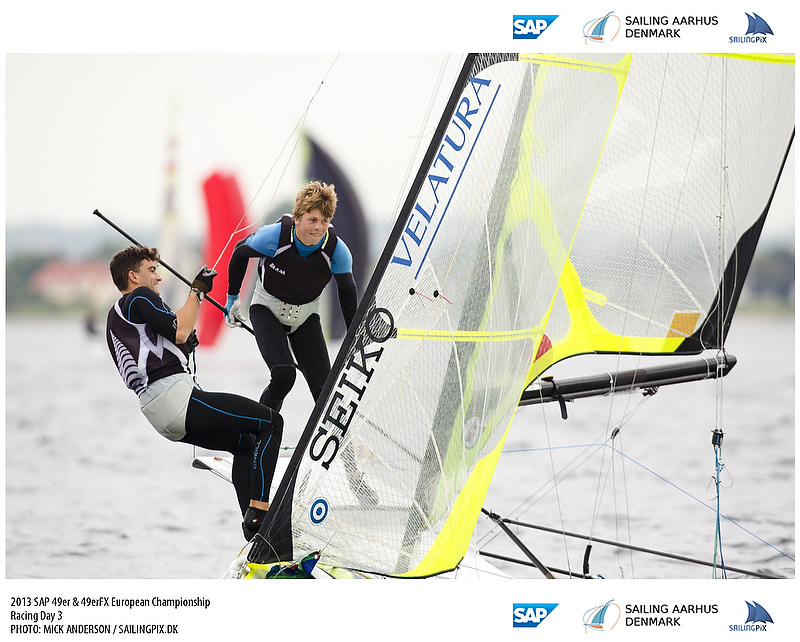 Jumping back in the boat only recently they had a great event at sail 4 gold to win out over the top British teams and some Aussies. 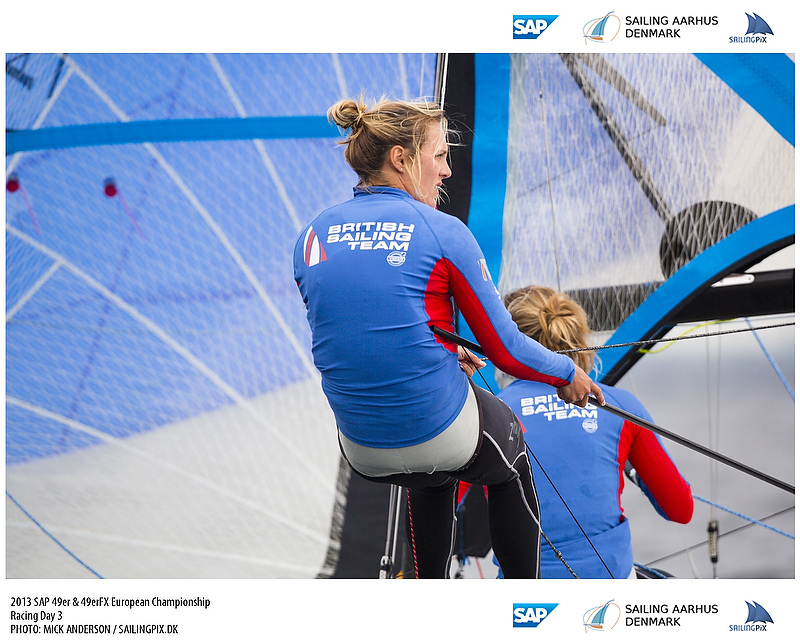 While they readily admit they are rusty, they seem to have quickly jumped back into the 2012 form that brought them to new heights leading up ot the London games. 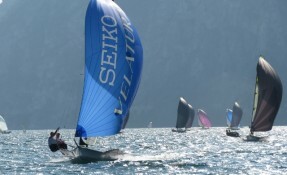 Kieler Woche 2013 was a typical event for the festival regatta. 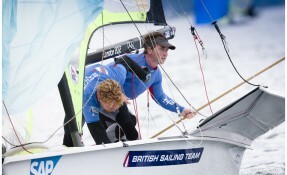 There was great racing all week in shifty conditions and a range of wind strengths. 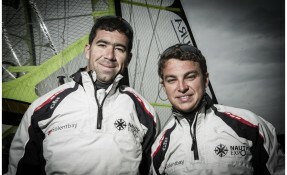 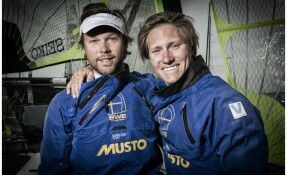 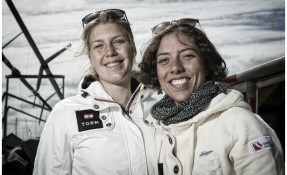 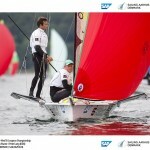 The Austrians are now one of the most experienced teams in the fleet now and handled the variety of conditions well. 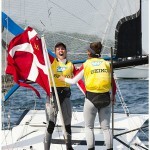 They scored solidly all week and then continued being on form in the theatre final. 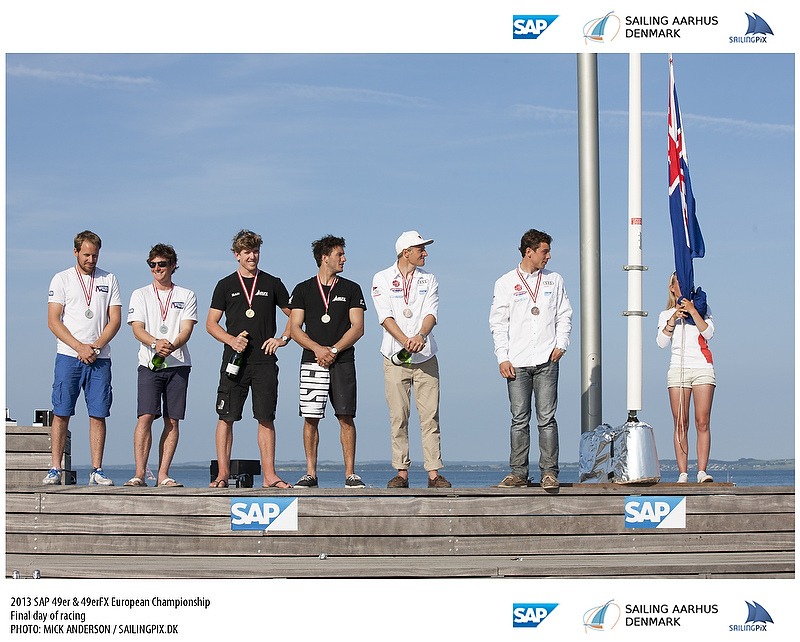 At the end of the event all that second place helmsman Heil from Germany could say was, “They are better than us right now.” High praise! 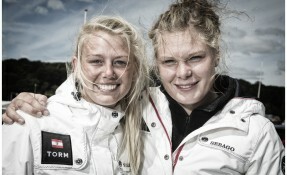 It’s a good time for them to be on form, and they will surely be in the running for the championship. 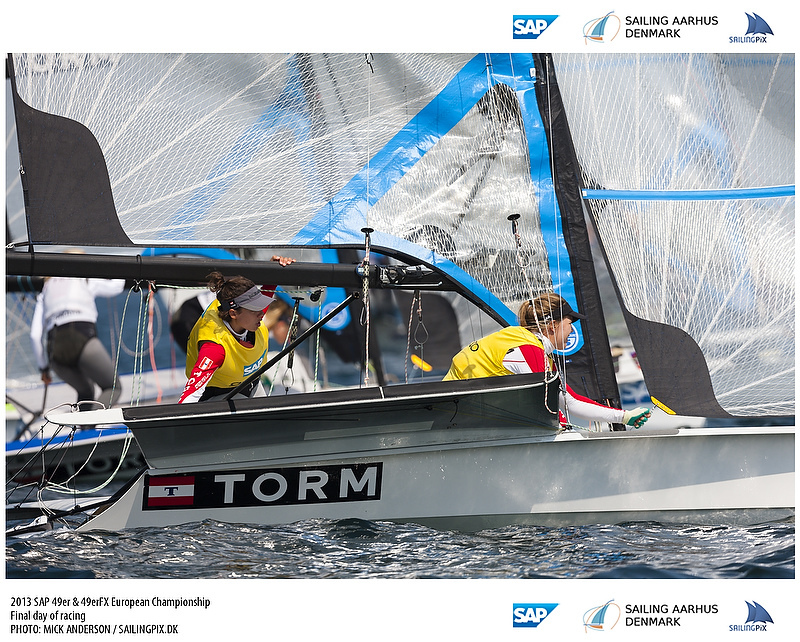 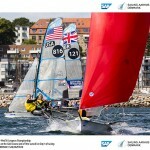 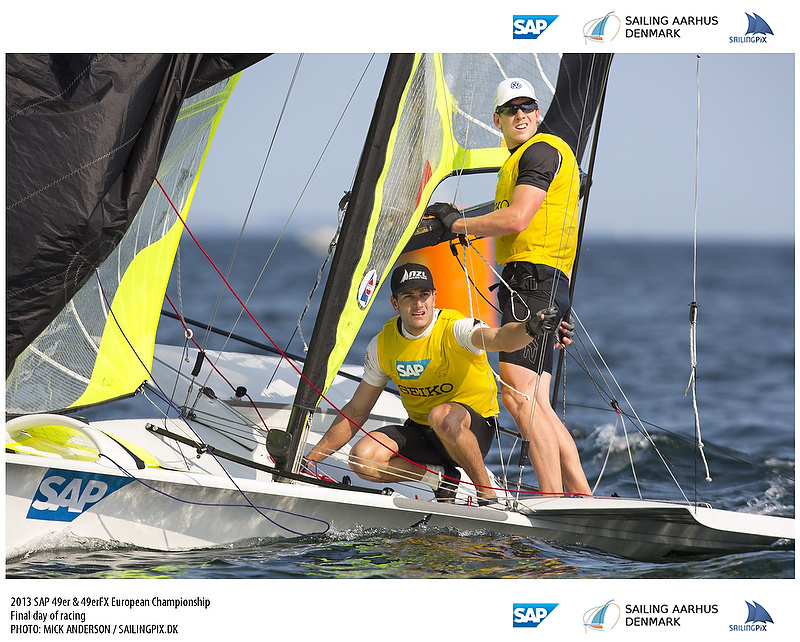 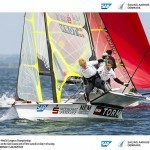 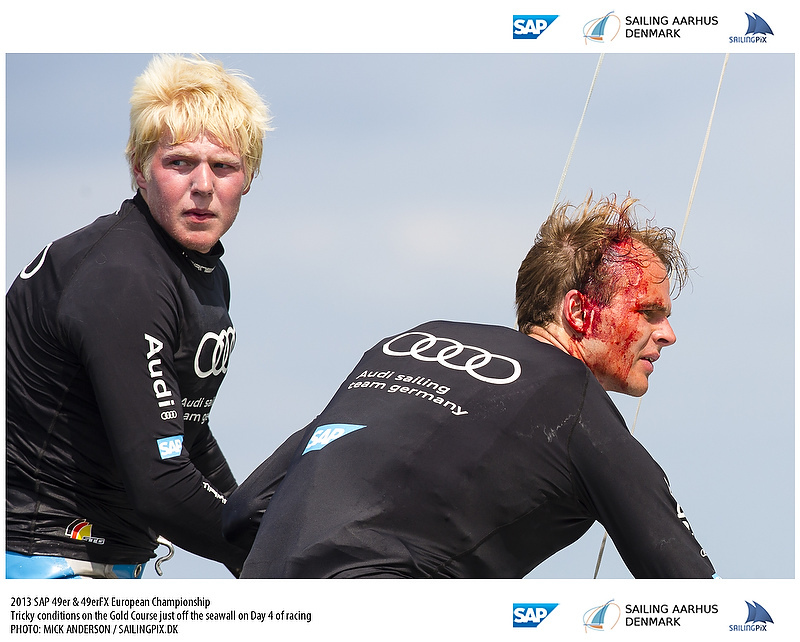 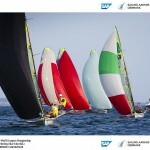 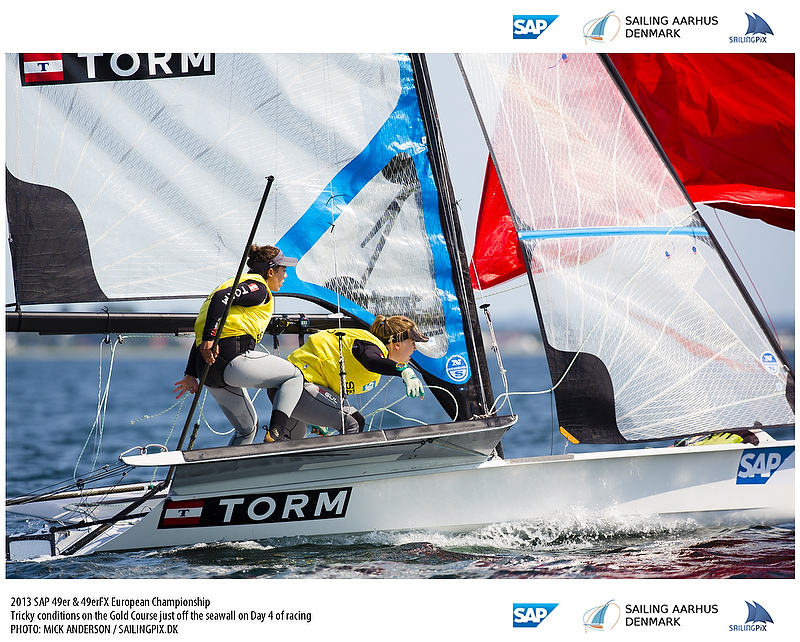 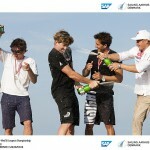 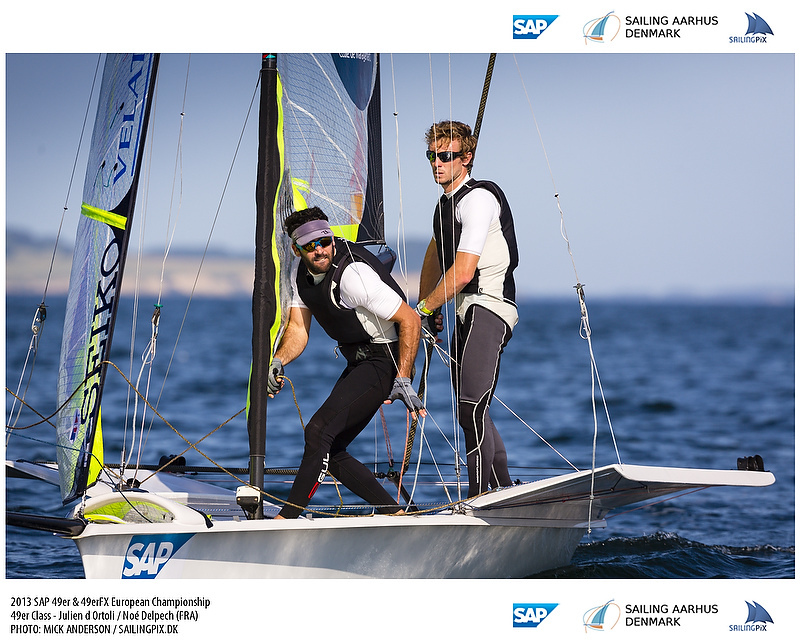 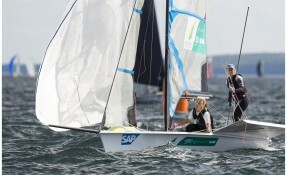 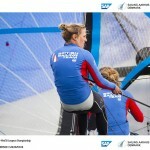 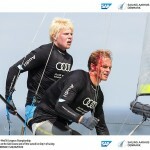 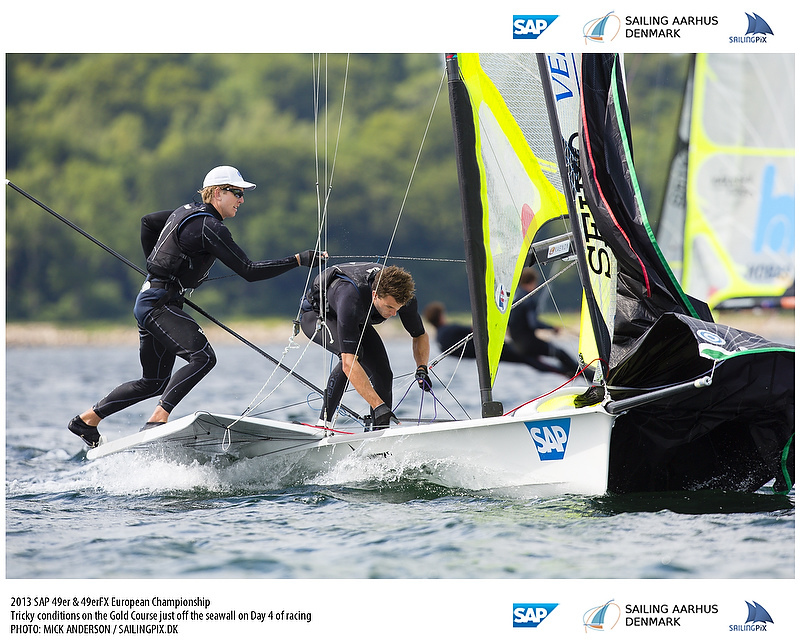 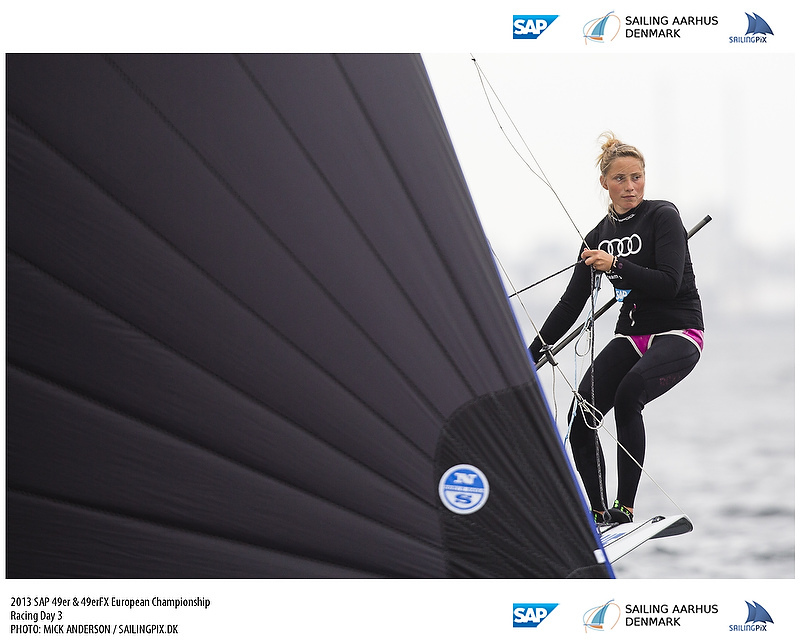 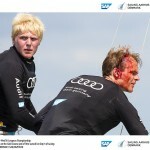 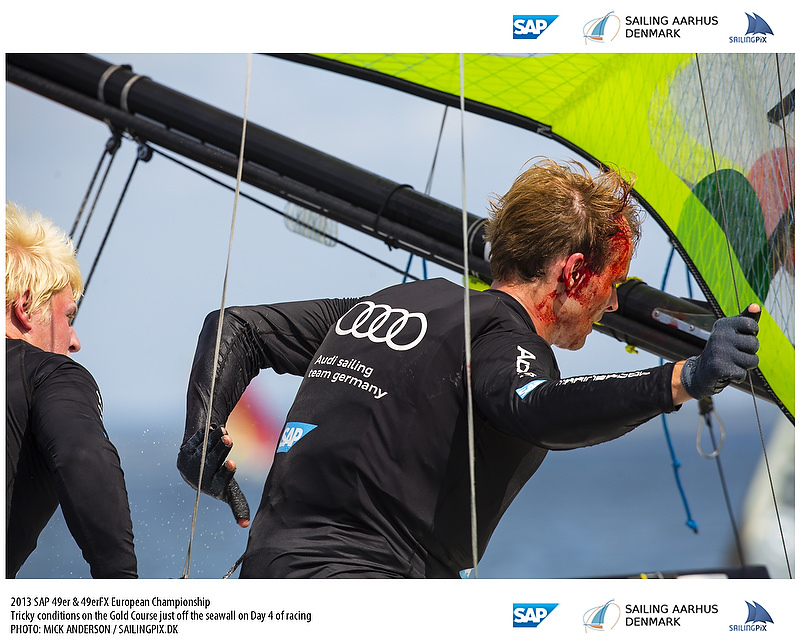 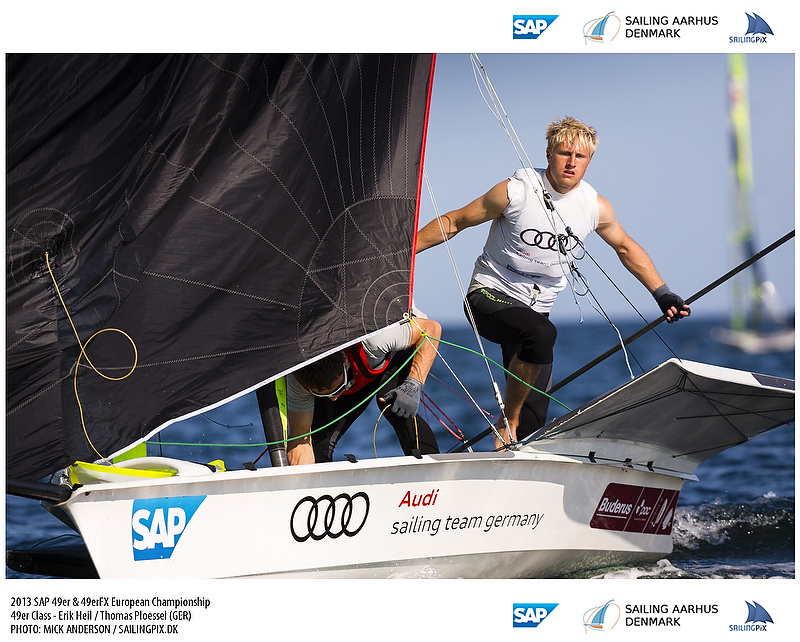 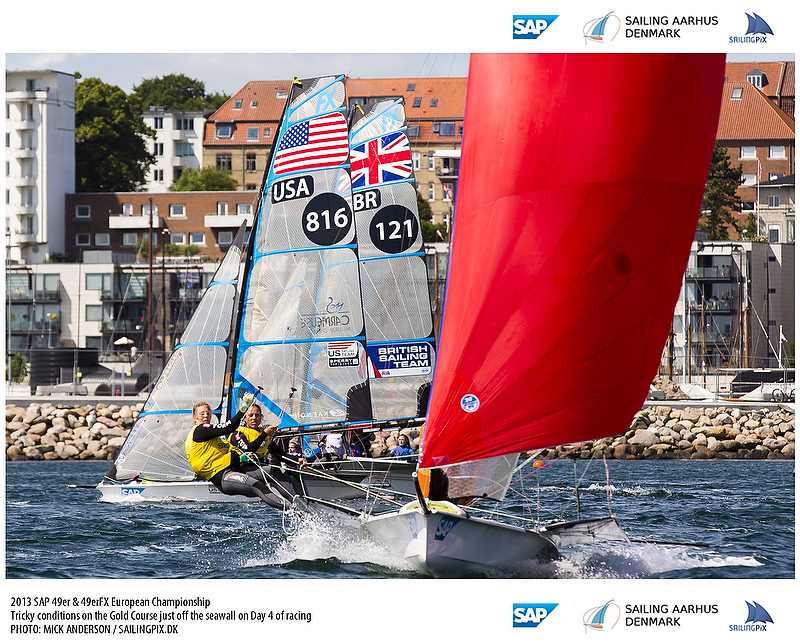 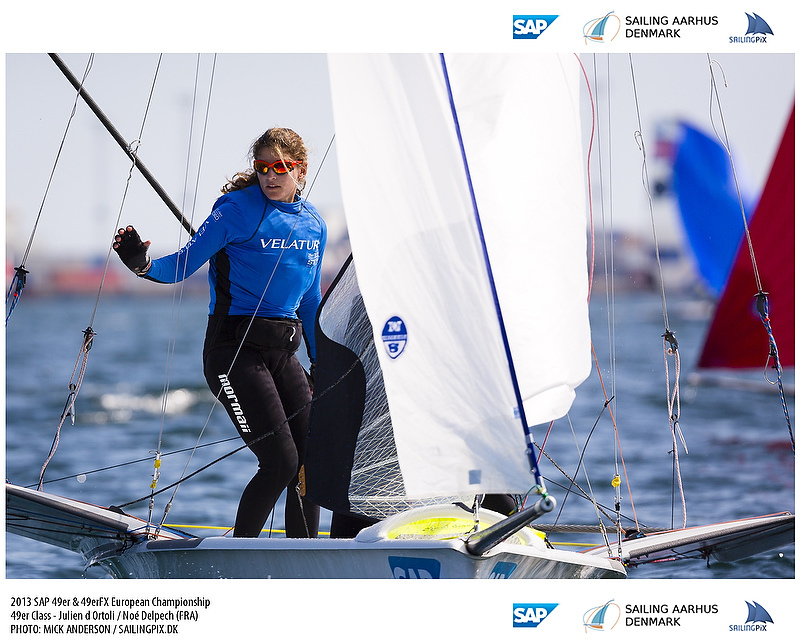 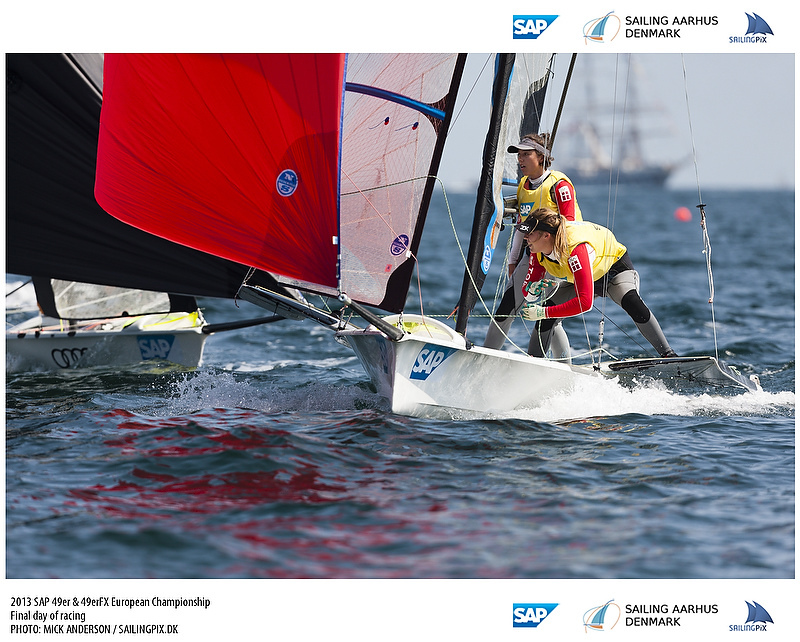 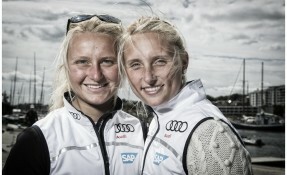 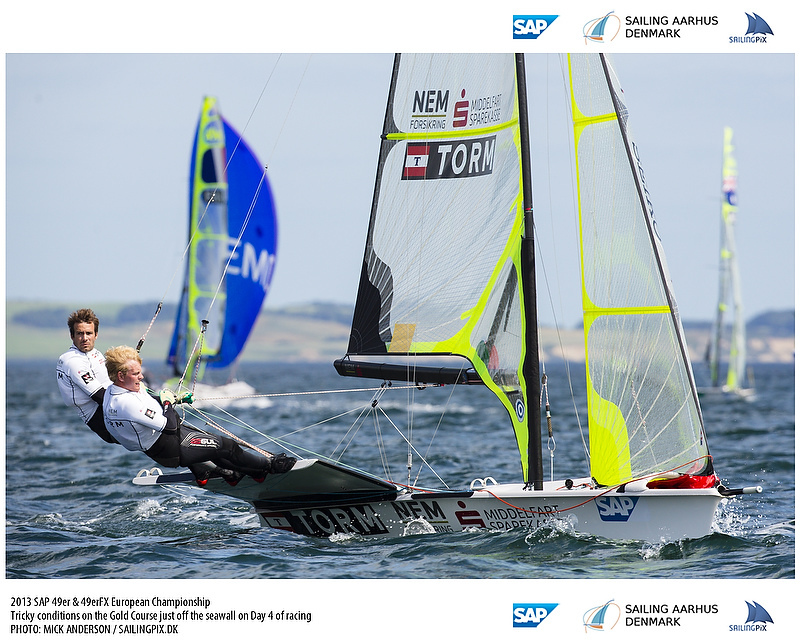 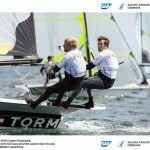 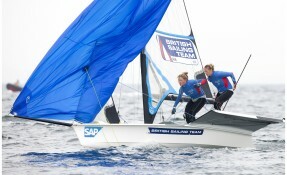 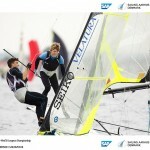 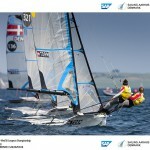 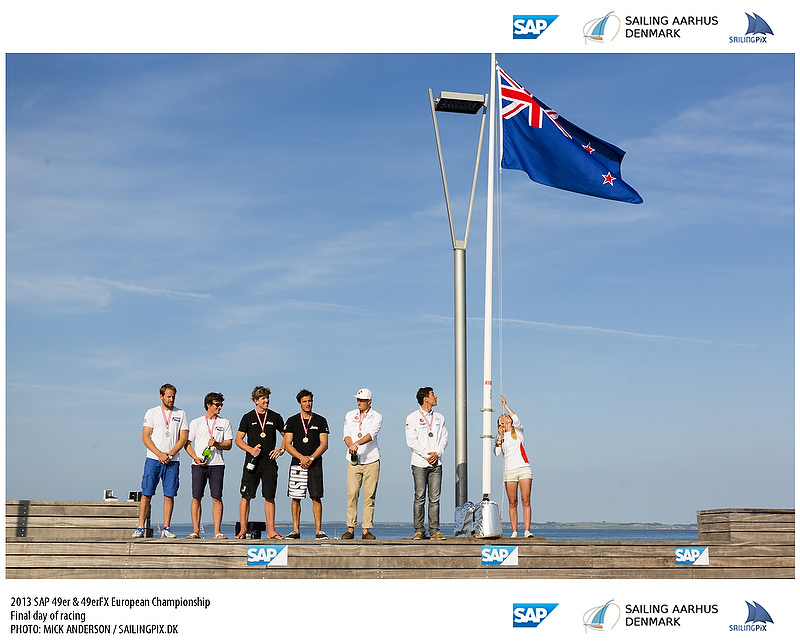 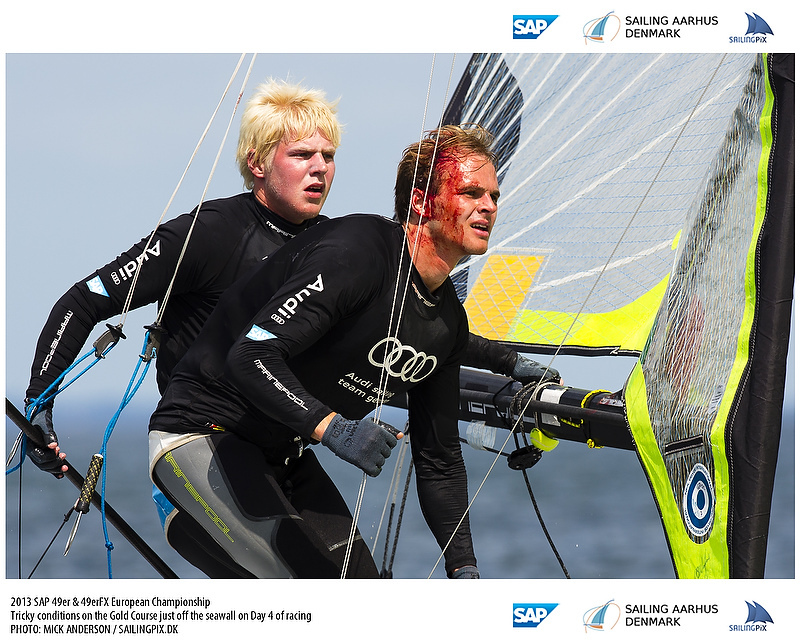 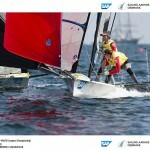 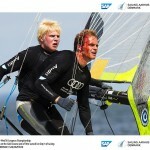 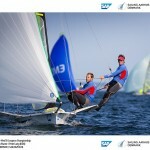 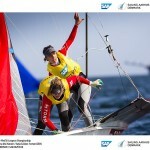 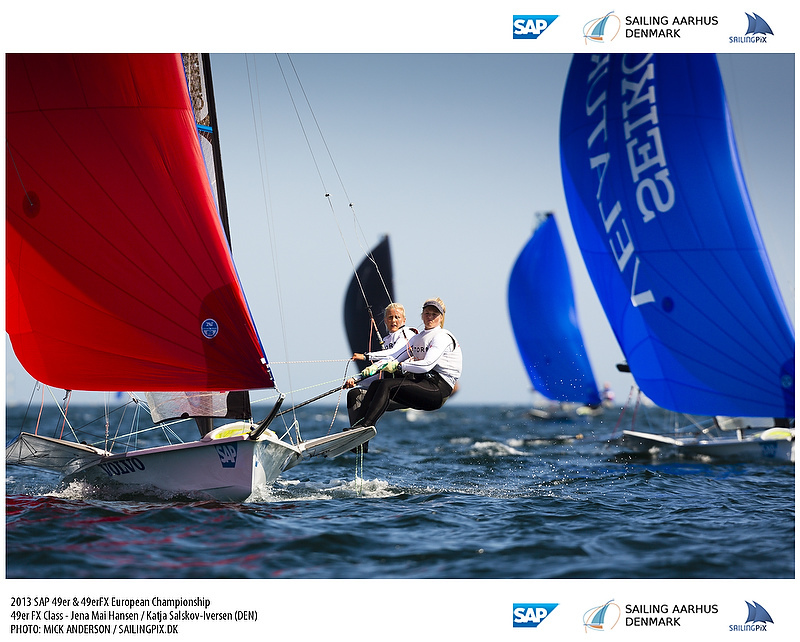 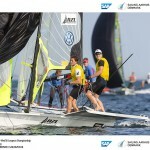 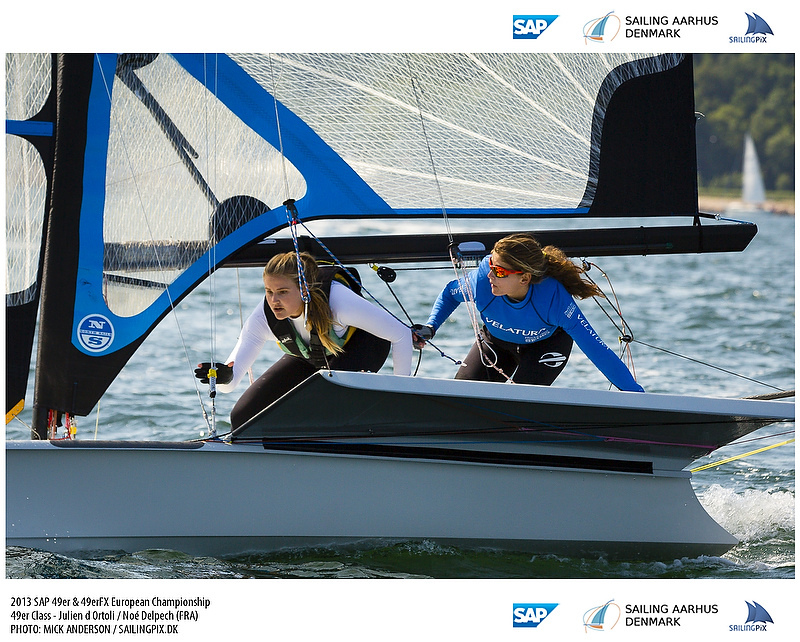 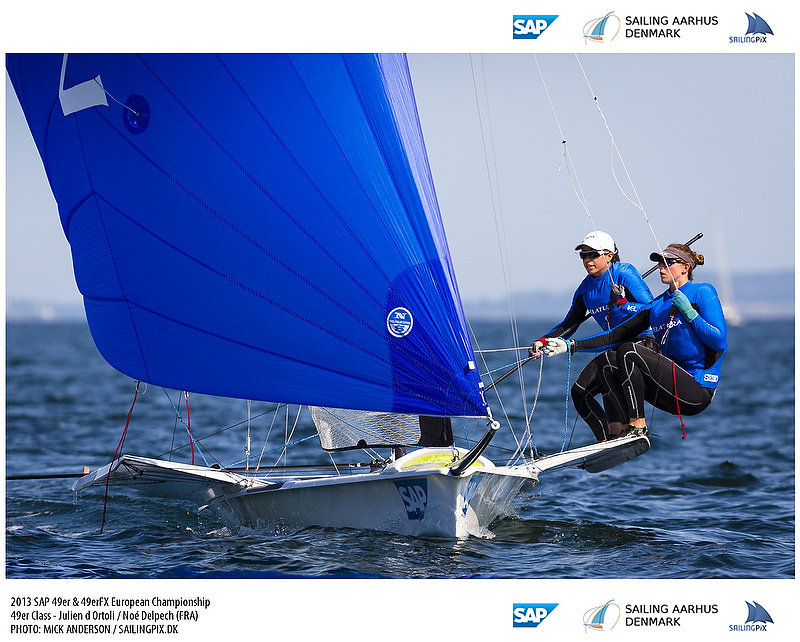 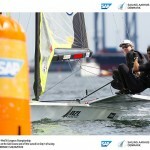 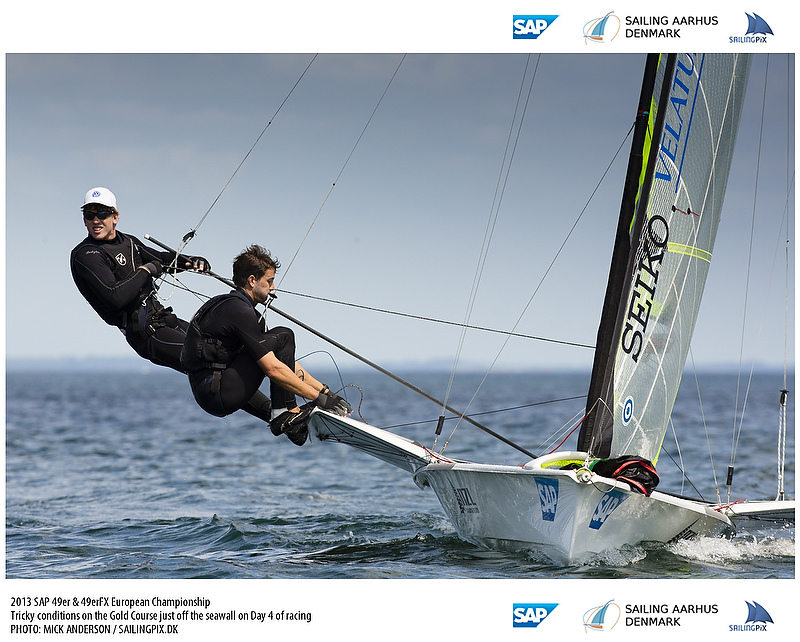 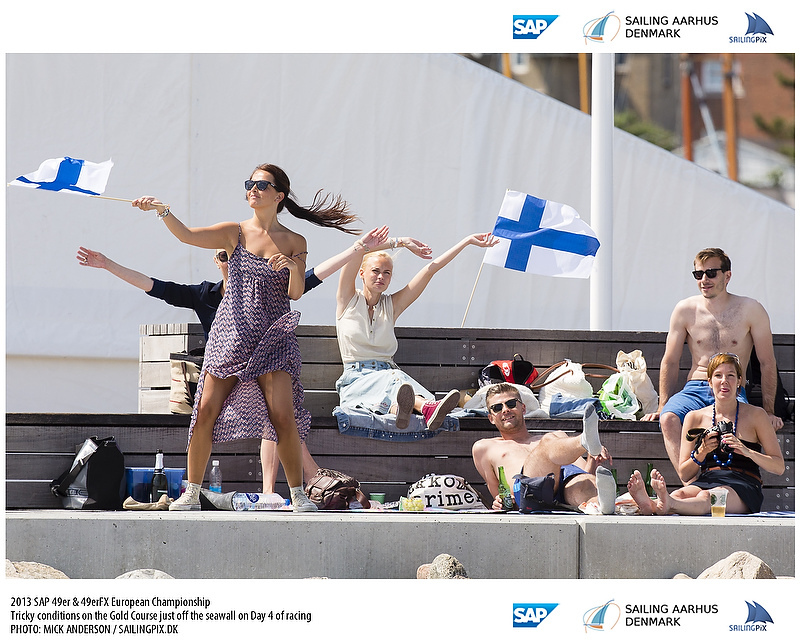 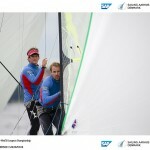 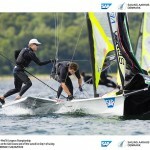 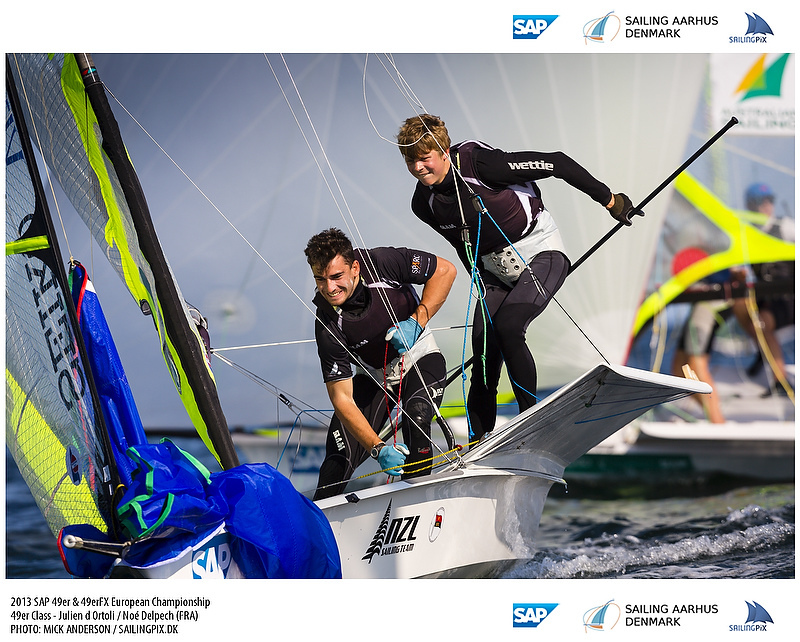 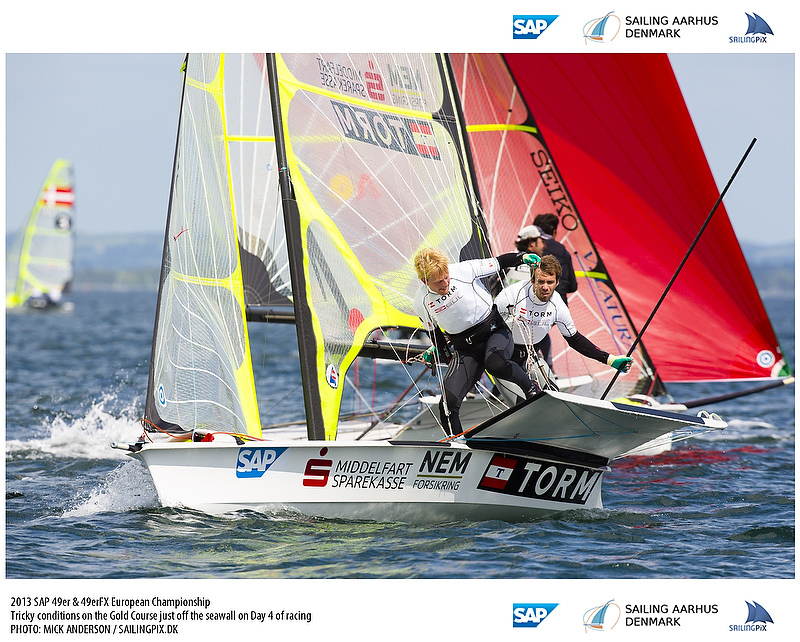 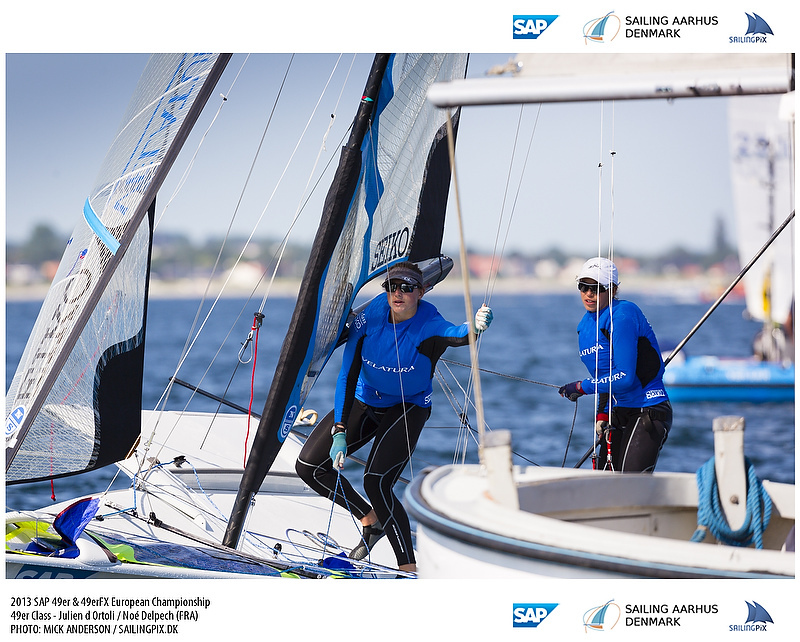 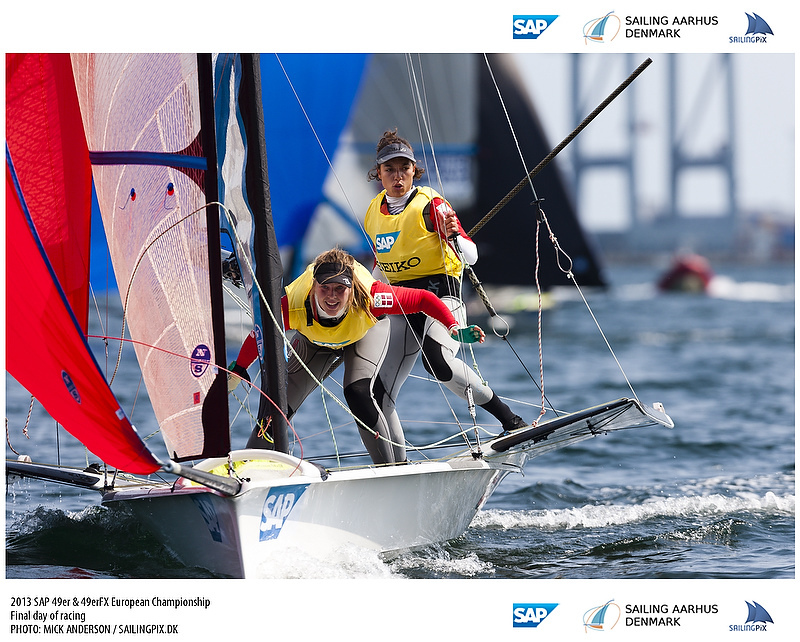 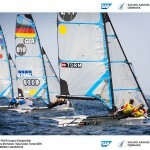 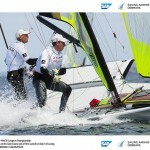 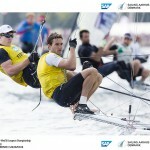 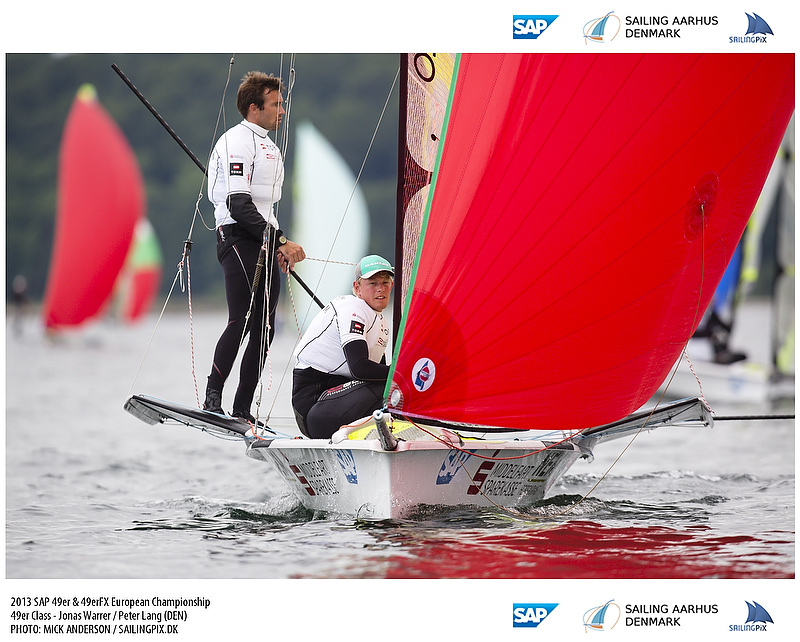 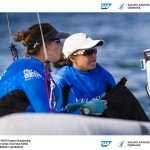 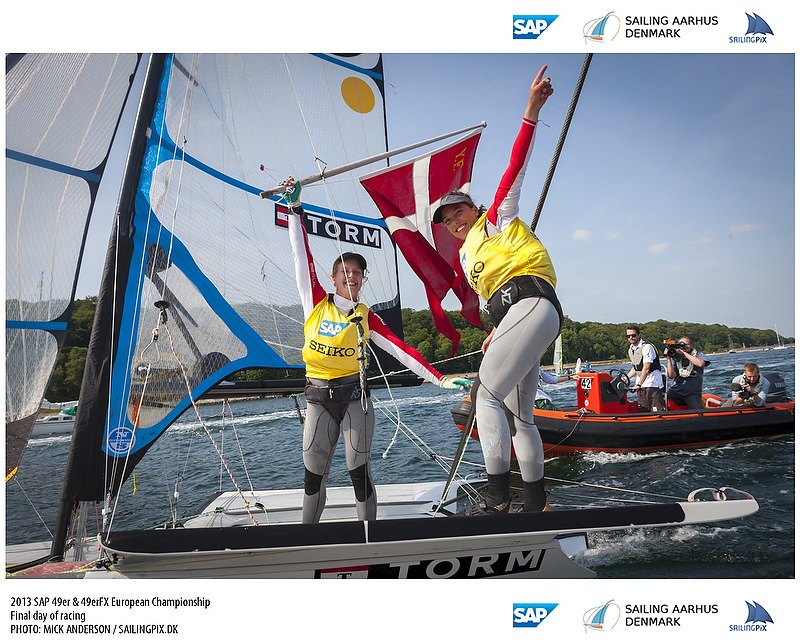 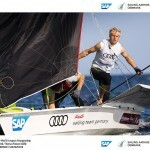 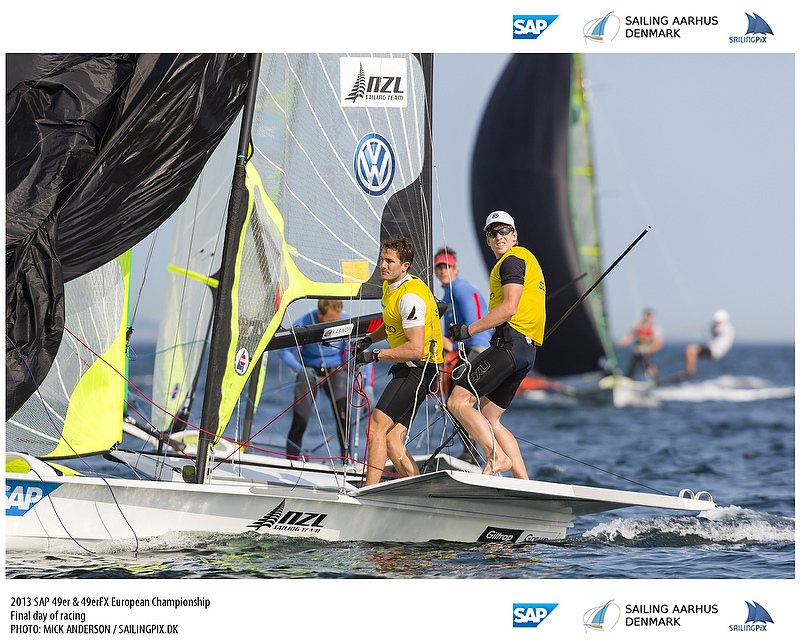 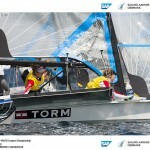 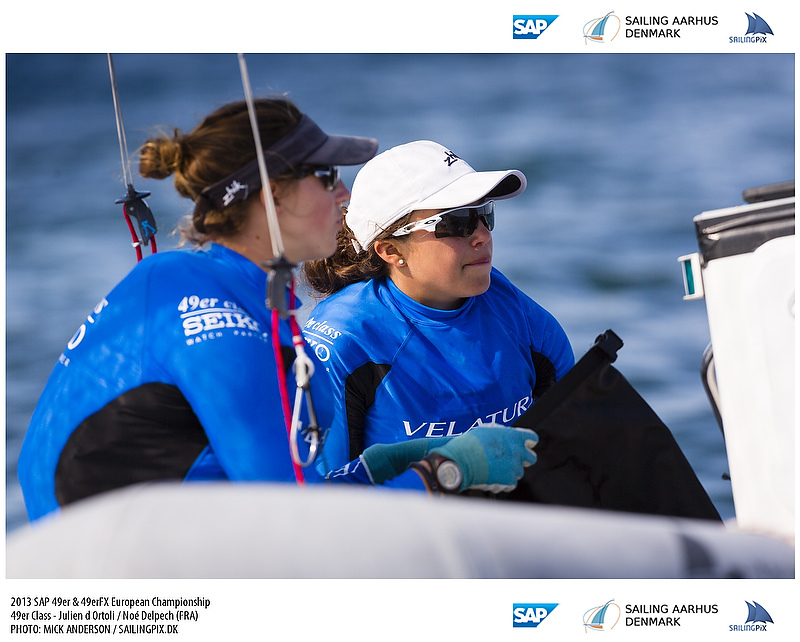 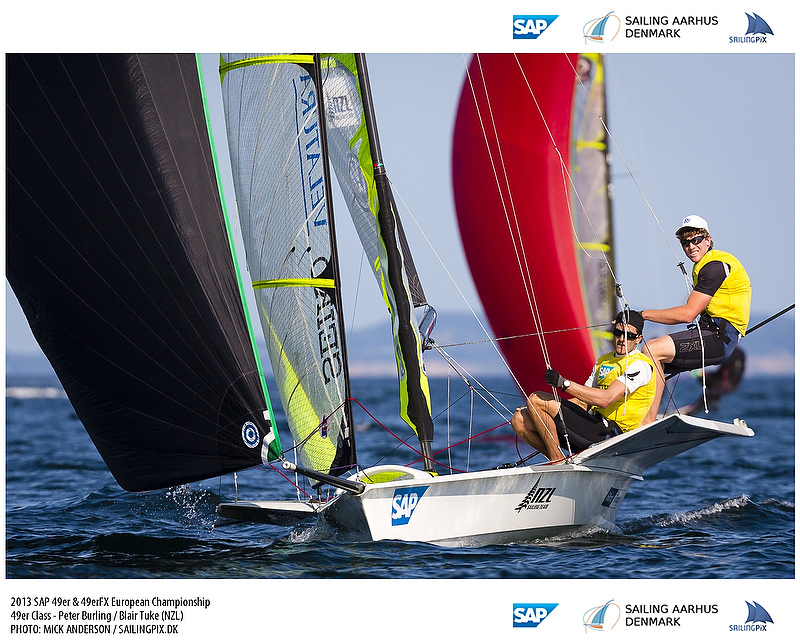 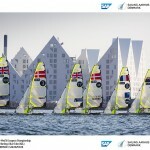 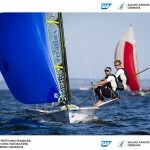 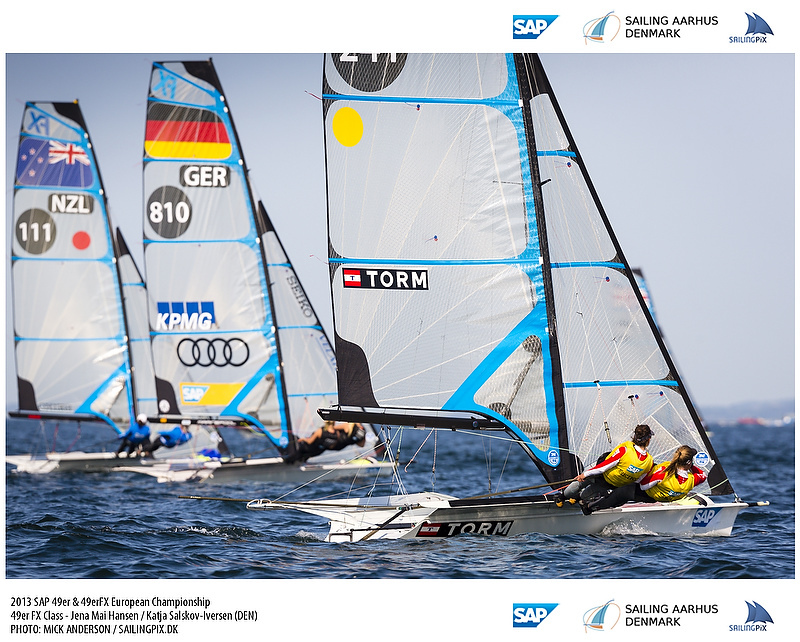 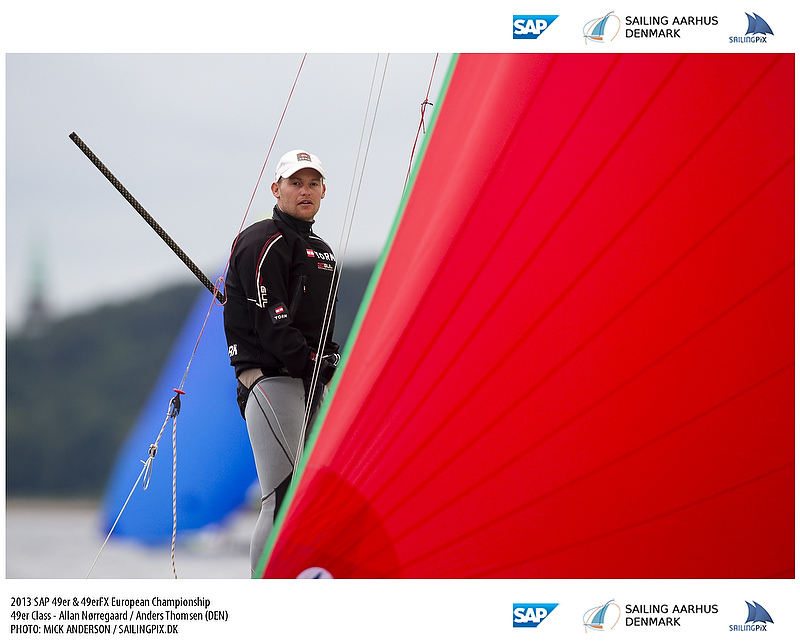 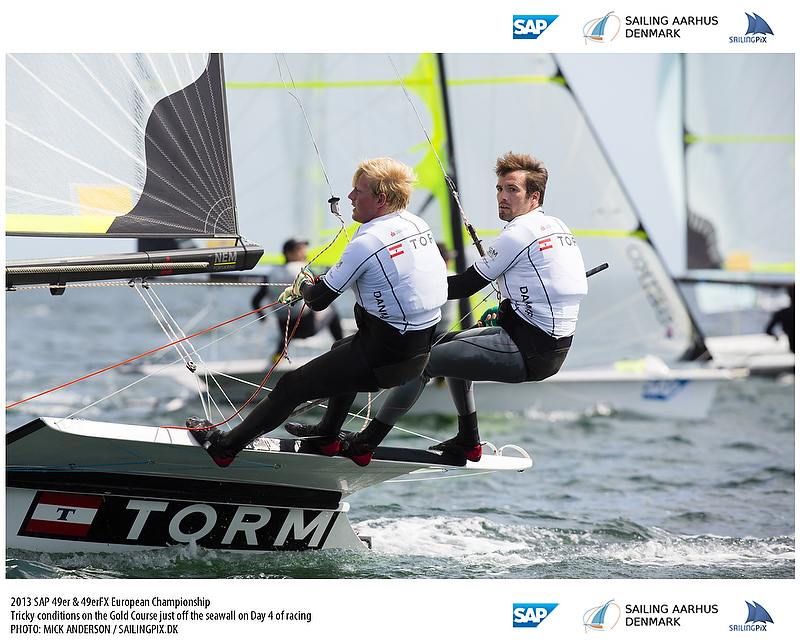 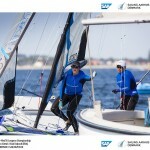 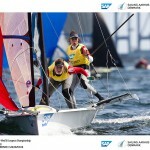 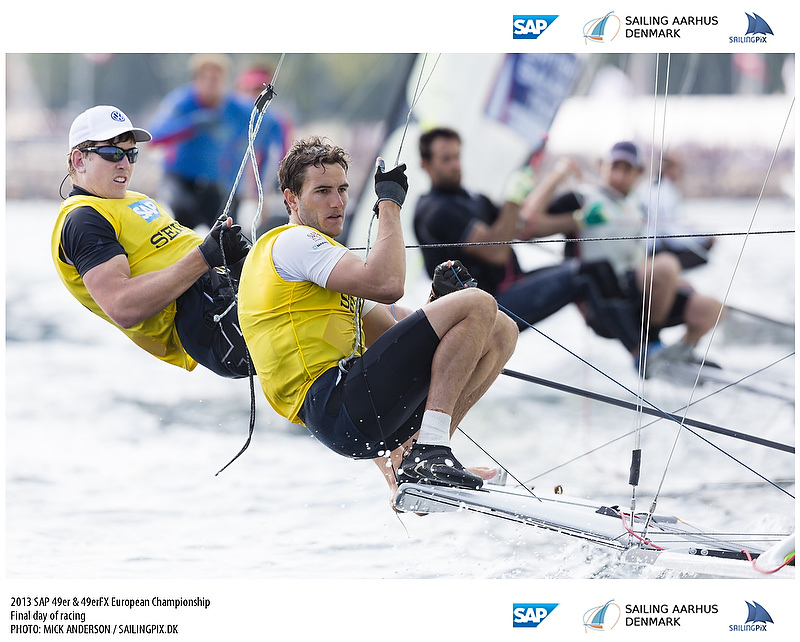 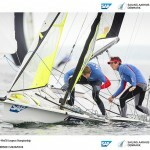 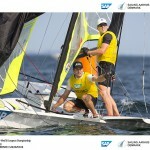 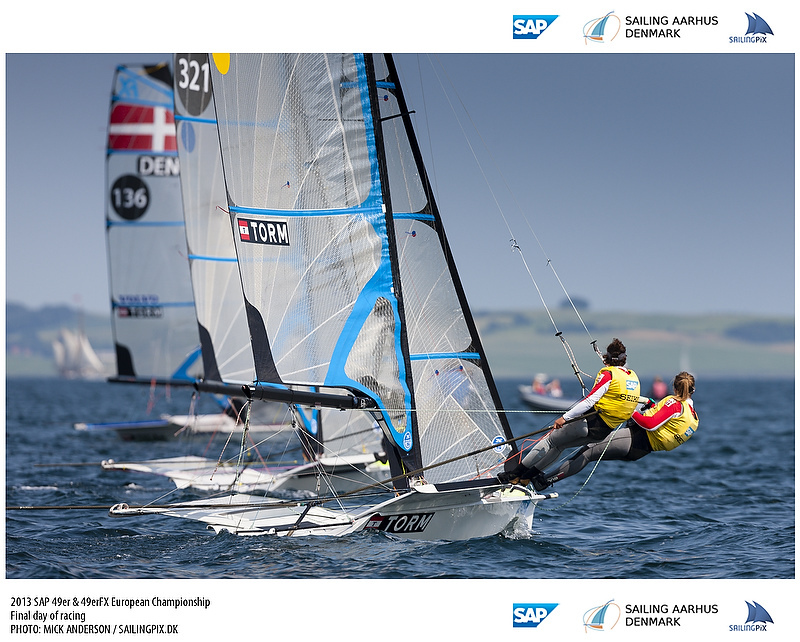 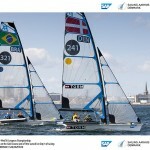 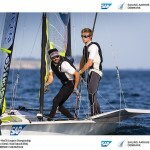 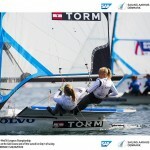 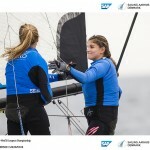 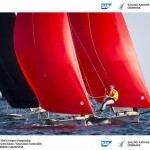 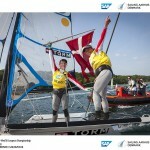 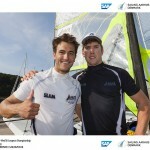 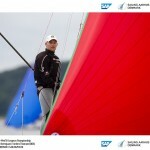 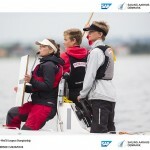 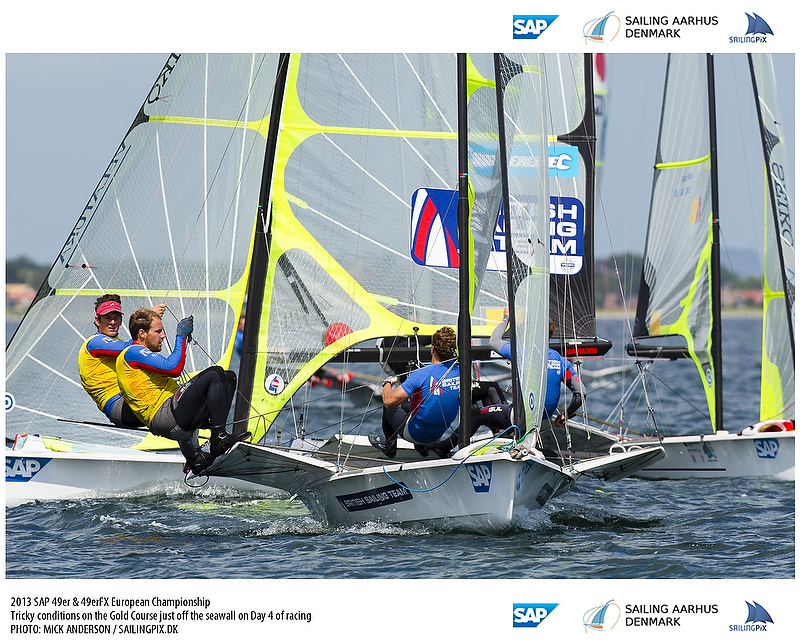 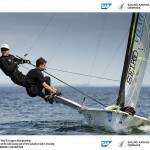 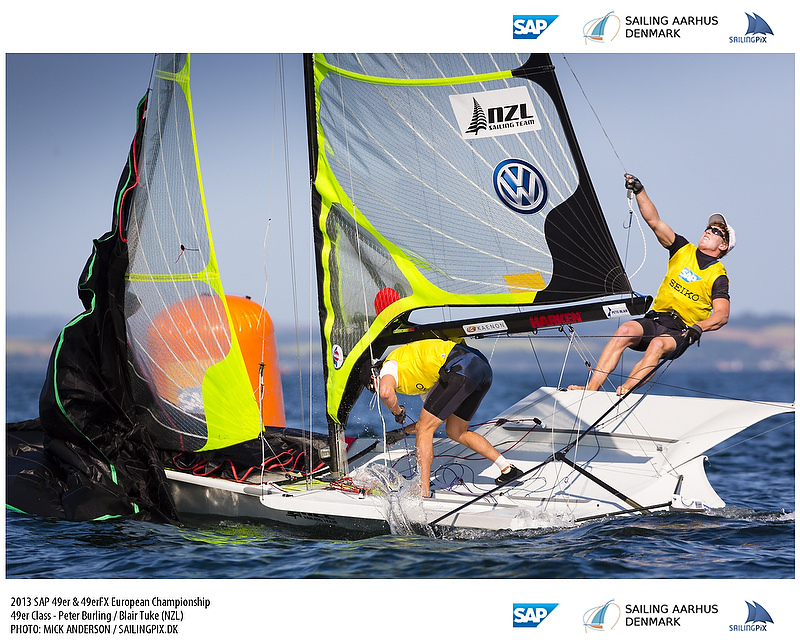 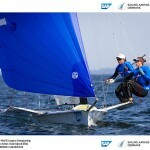 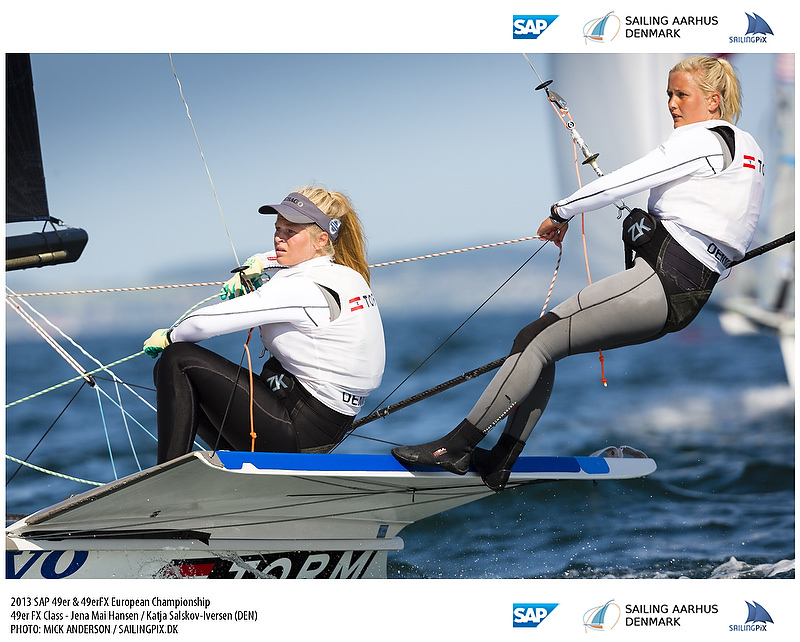 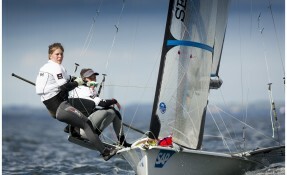 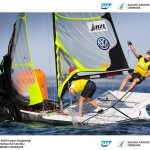 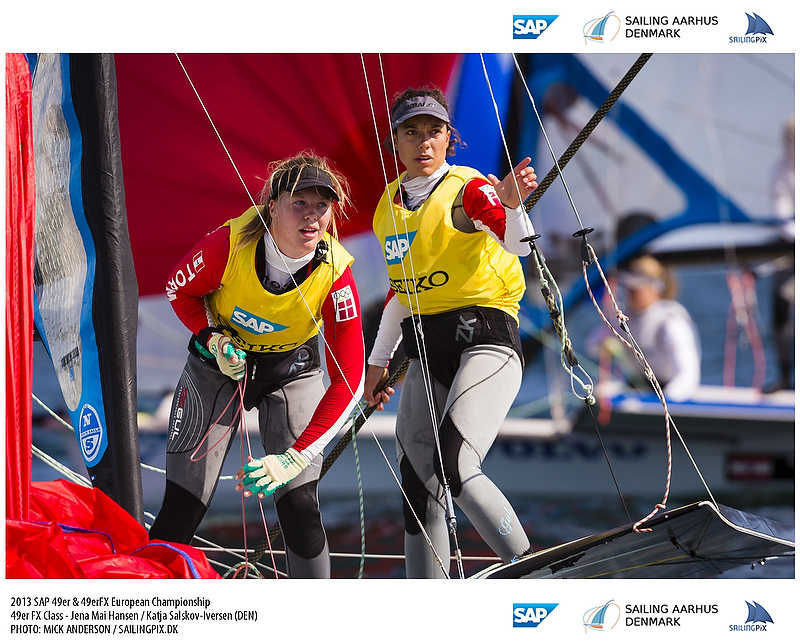 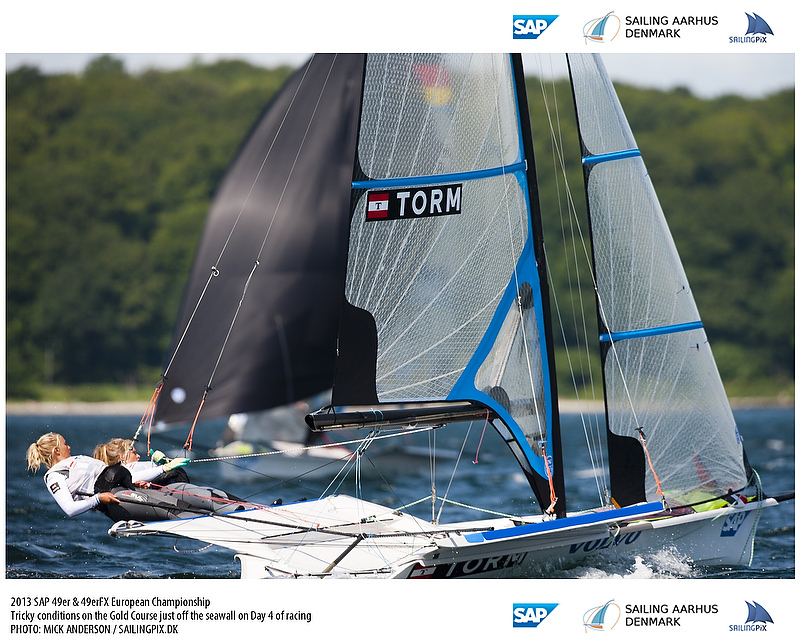 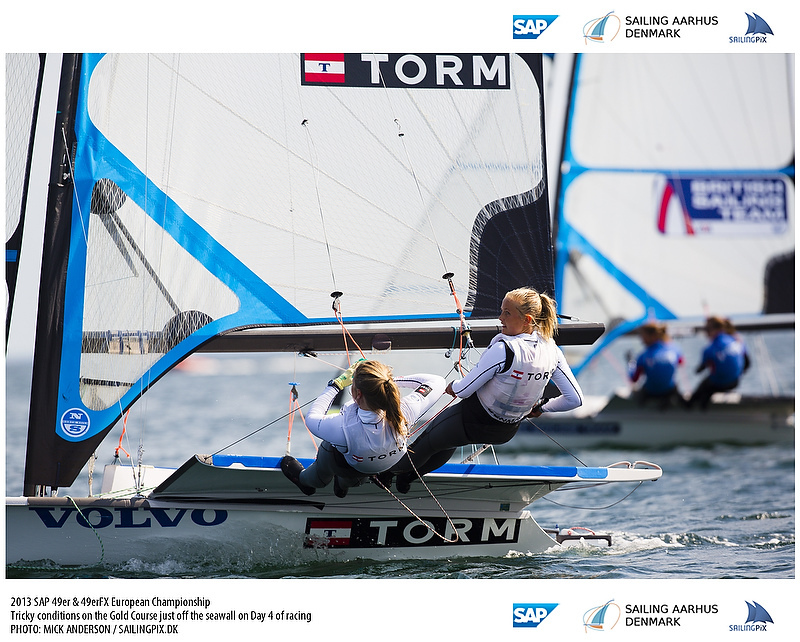 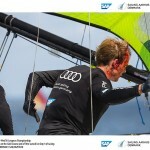 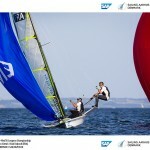 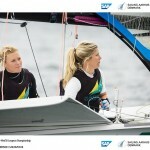 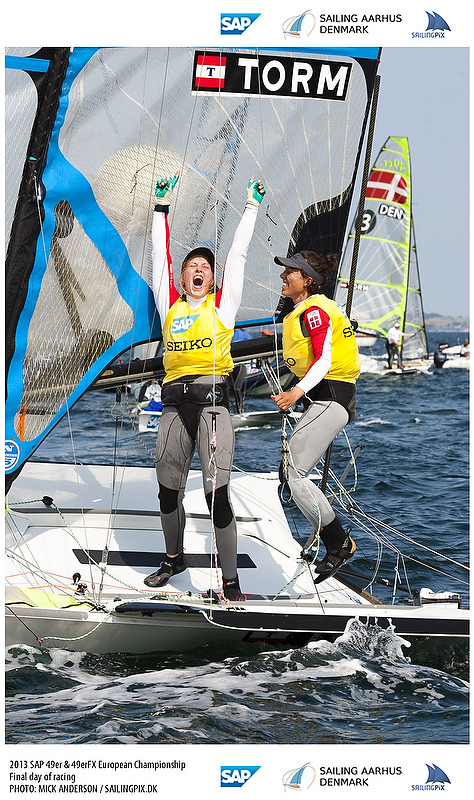 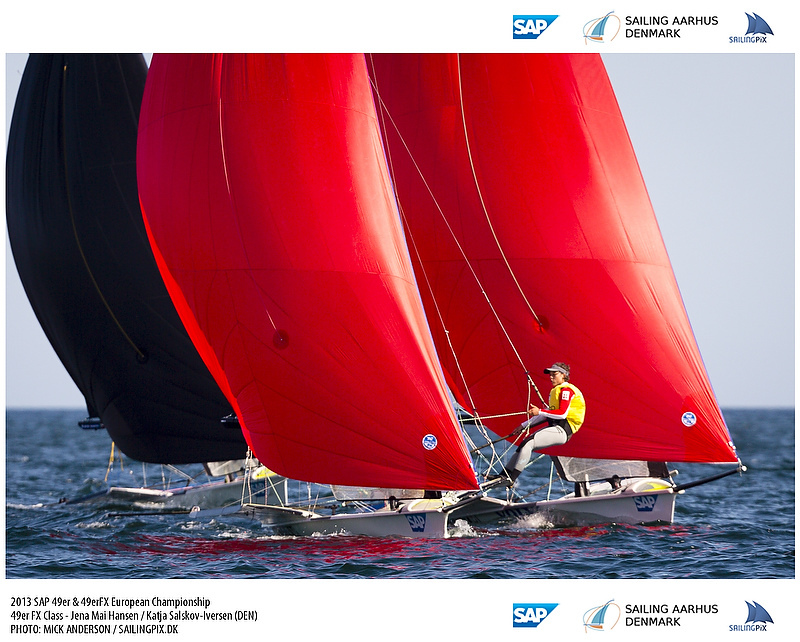 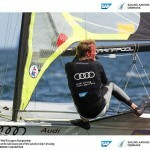 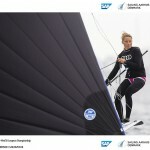 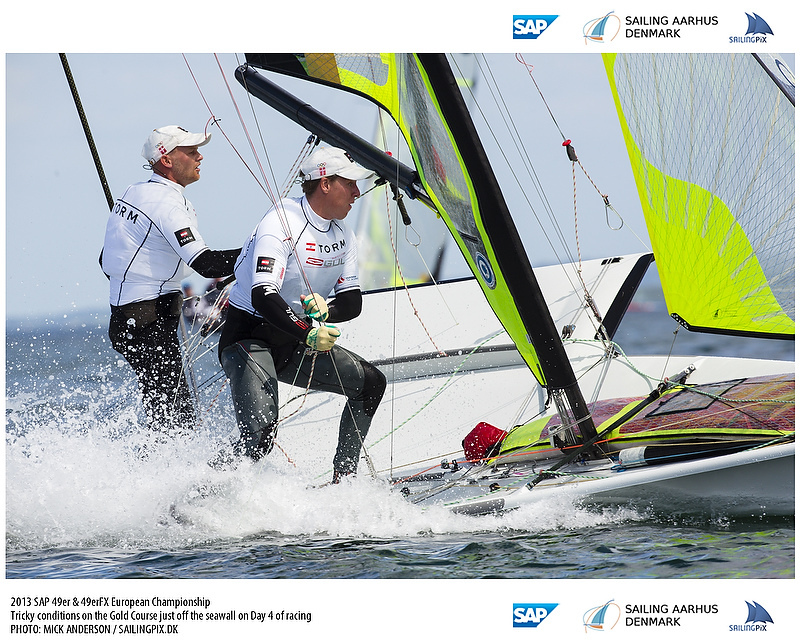 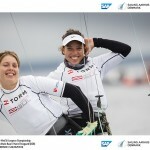 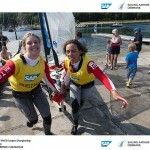 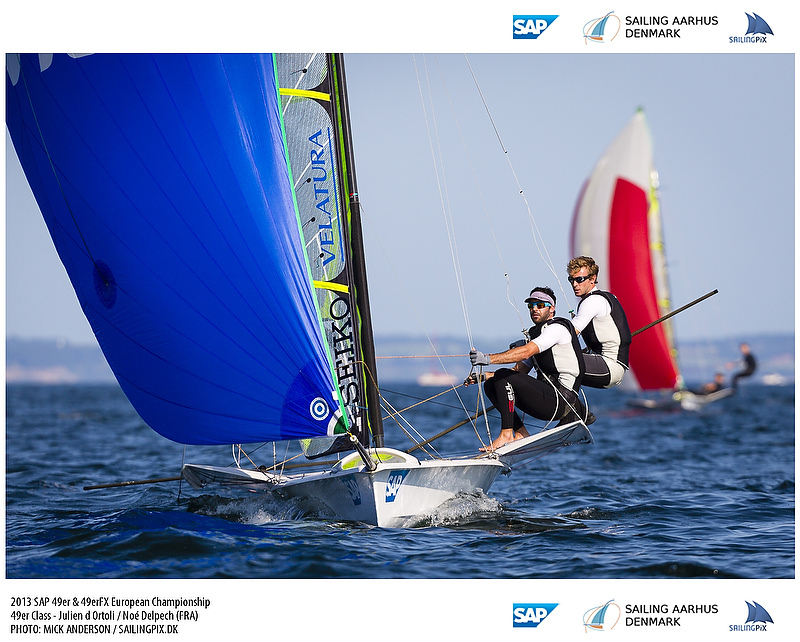 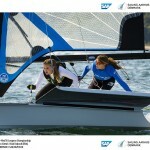 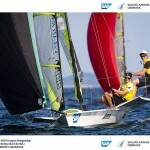 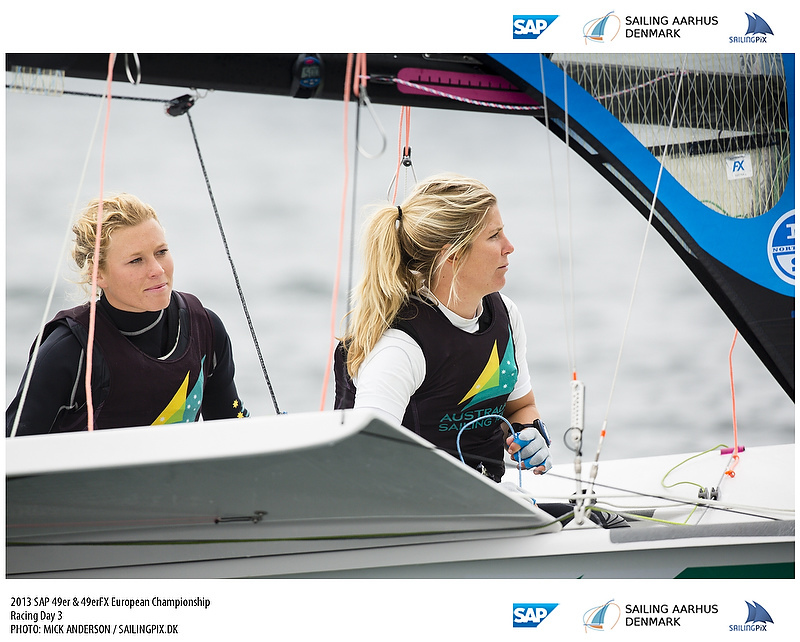 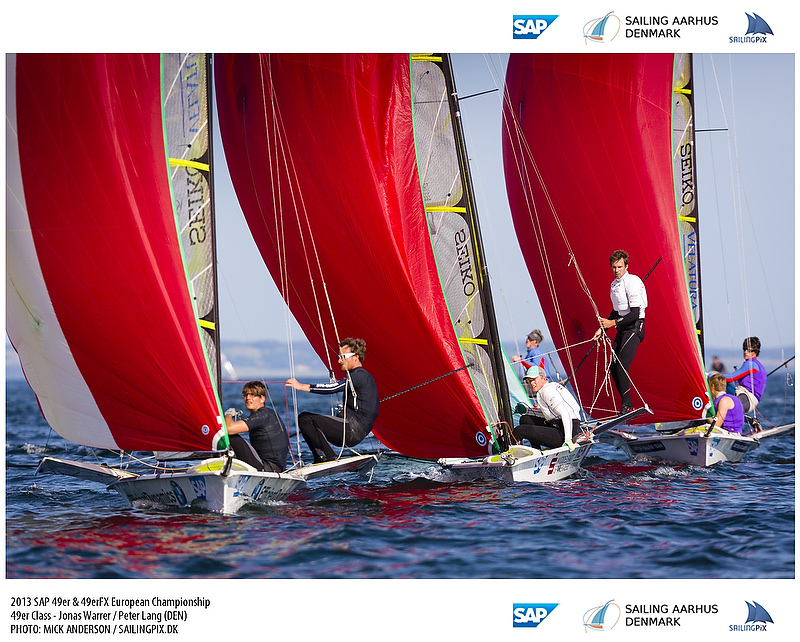 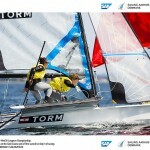 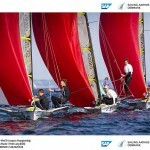 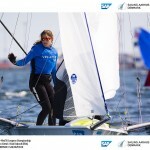 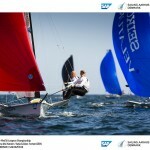 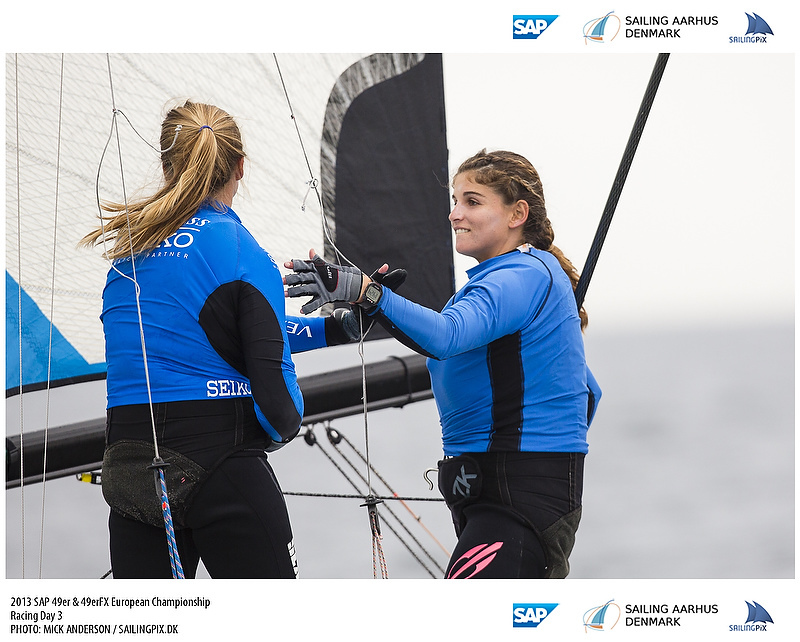 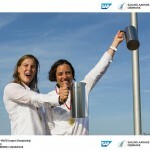 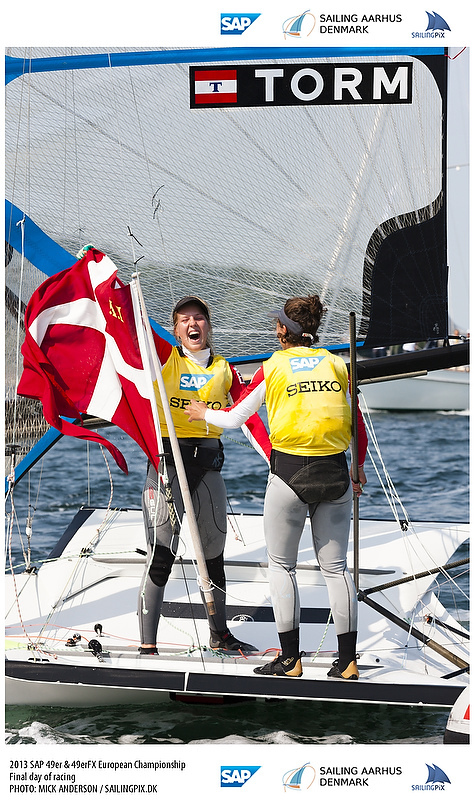 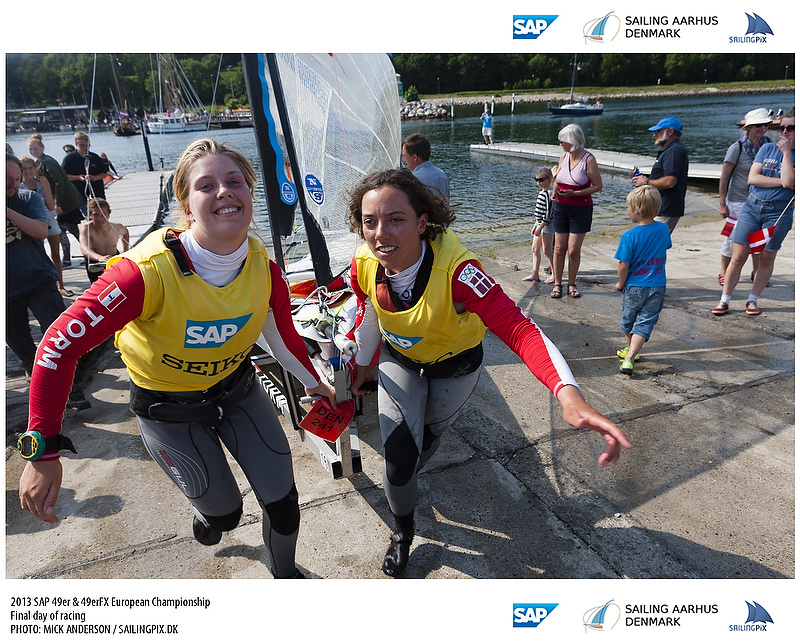 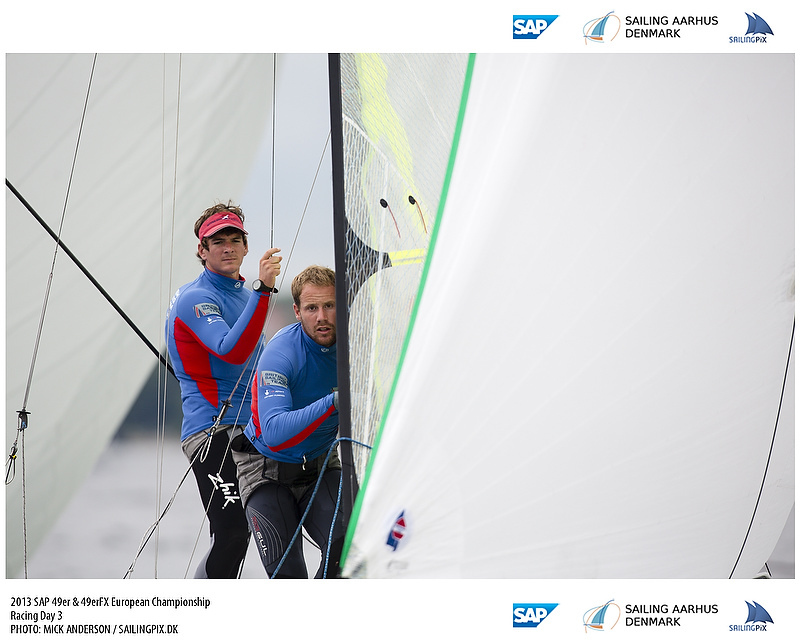 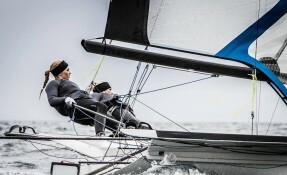 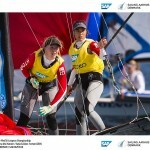 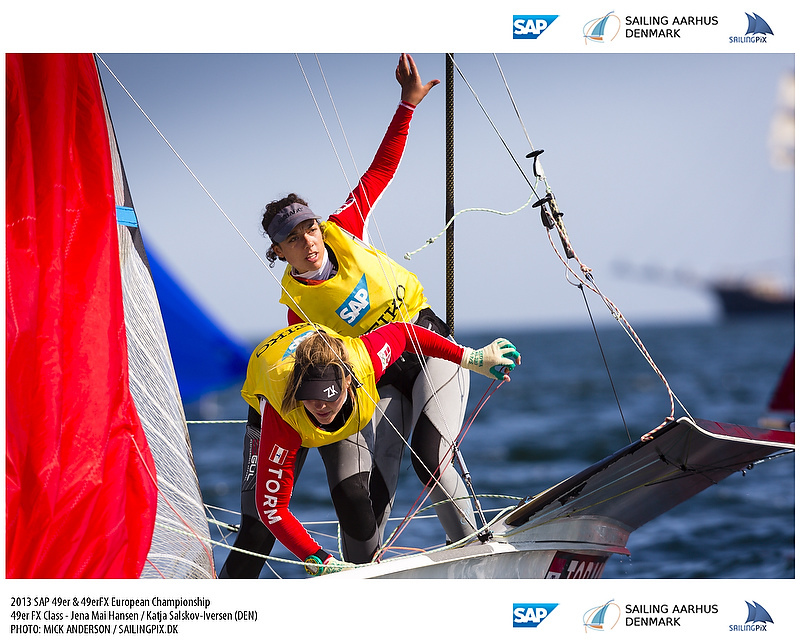 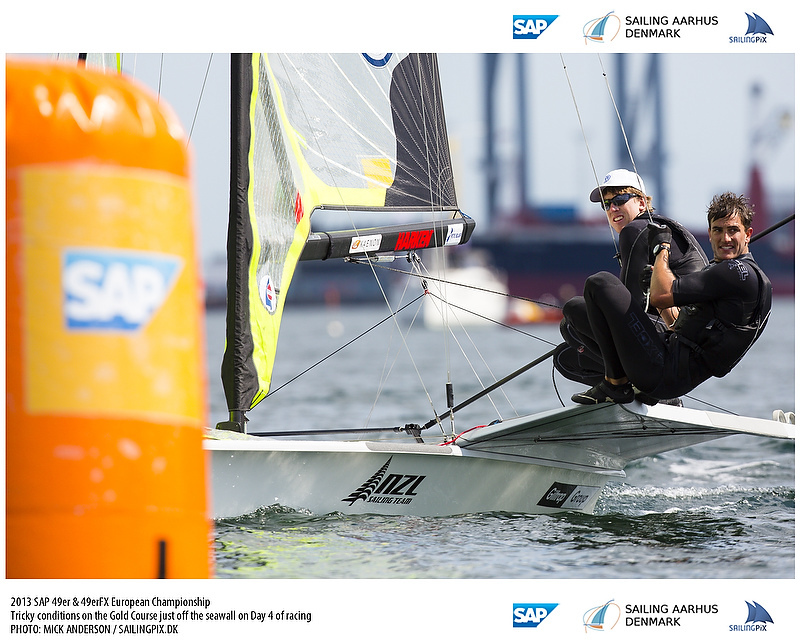 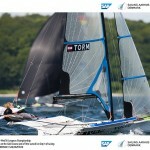 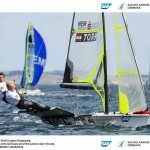 One of the most fortunate parts of the event was that we got to watch a lot of it with SAP unveiling their latest broadcast technology which they will be bringing to the 2013 49er & 49erFX European Championships in Aarhus. 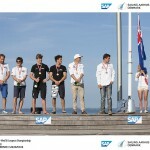 The rest of the Contenders! 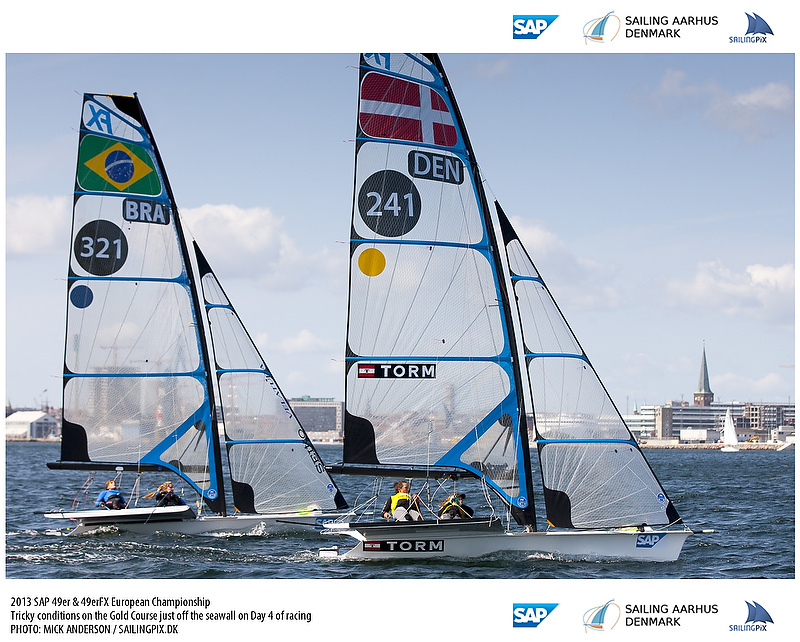 And here is where it gets interesting folks… we haven’t even mentioned the team everybody is talking about in the boat park right now! 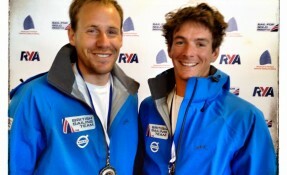 These Silver medallists from 2012 took the winter to go off AC sailing with peter doing very well at Team Korea in the AC 45s. 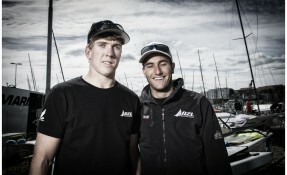 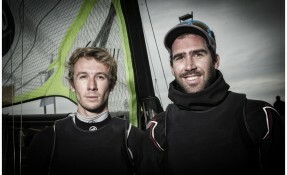 These two have been at the top of the 49er scene since becoming traning partners with Nathan and Goobs. 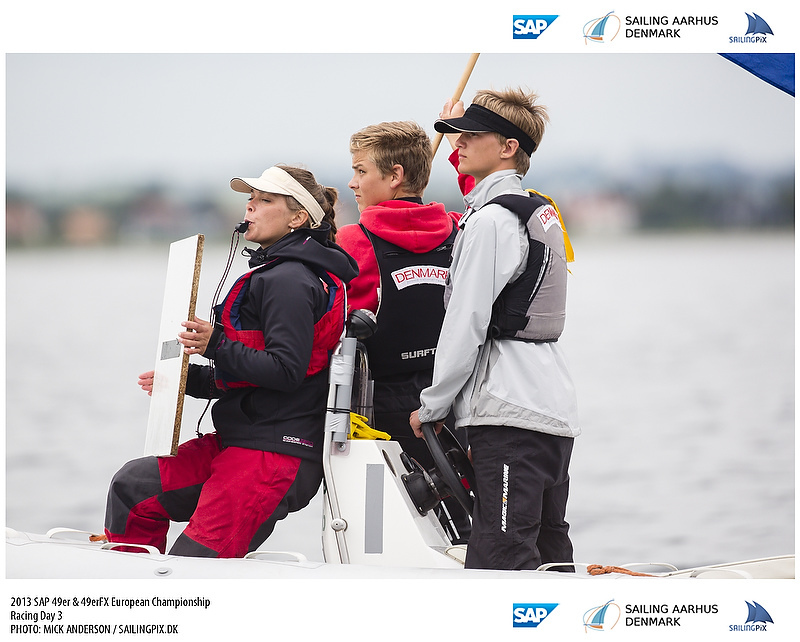 More recently, they won something like 8 of 10 races at the coaches regatta held just ahead of the Euros in a good fleet including a number of contenders. 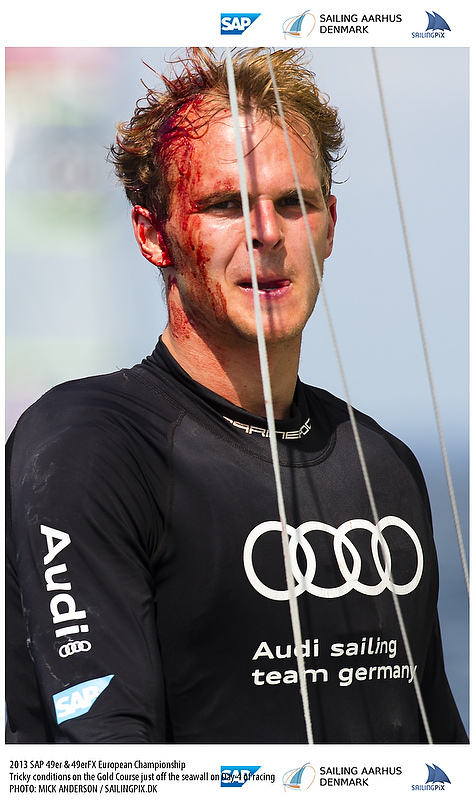 They’ve got to be the favorites heading into the event, except how can you call anyone a favorite in a year that’s shaping up like this one? 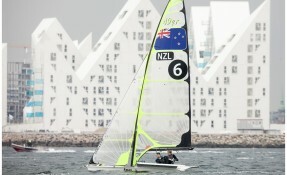 You know it’s a long list of contenders when we’re 11 deep and haven’t even mentioned the recent Bronze Medallist!!! 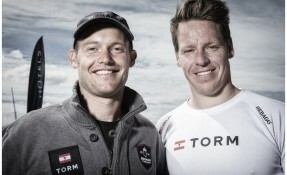 Allan teamed up with Anders for the 2012 Euros and has been training right through with winter. 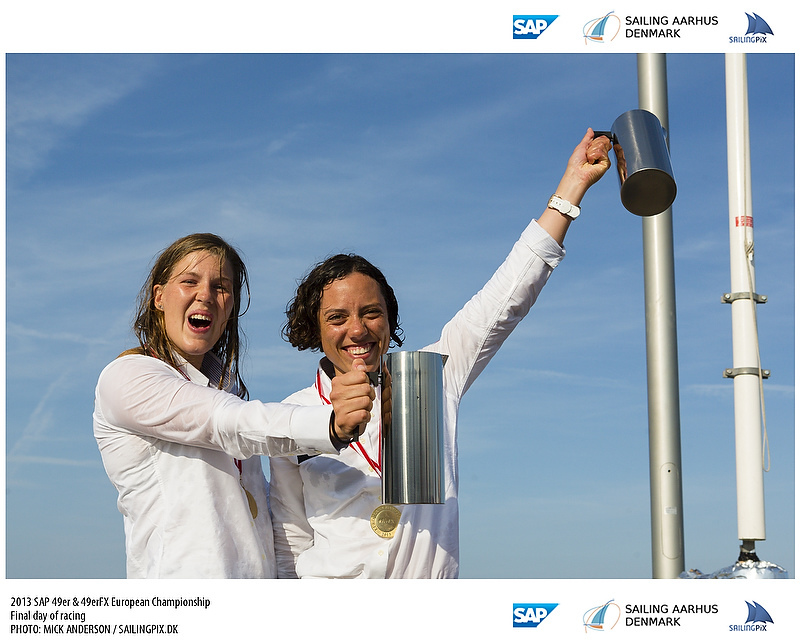 They dominated the European championship in 2012 with their innovative Tower Trapezing only to fall to silver in the winner takes all final. 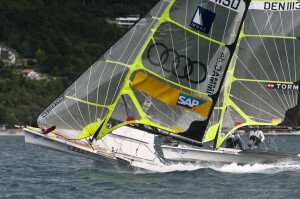 Ever the creative mind, you can bet Allan has been planning for a long time how to win this one on home waters. 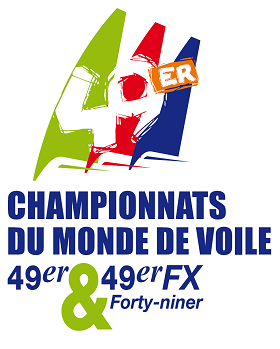 A number of other teams could also break through to win this championship, and all the teams listed here have a realistic shot, either because they’ve done it in the past or they’ve been close recently! 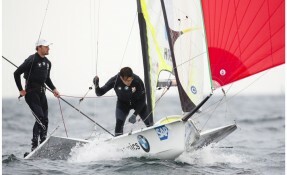 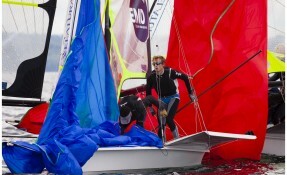 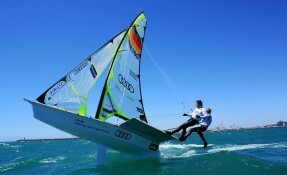 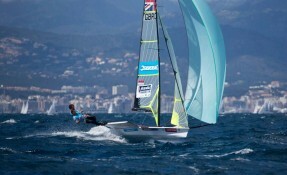 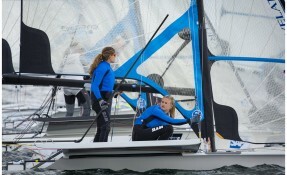 Tune in to 49er.org starting july 2nd to catch up with all the action and watch this event unfold!